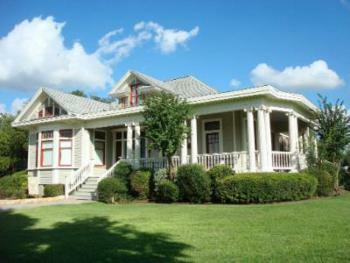 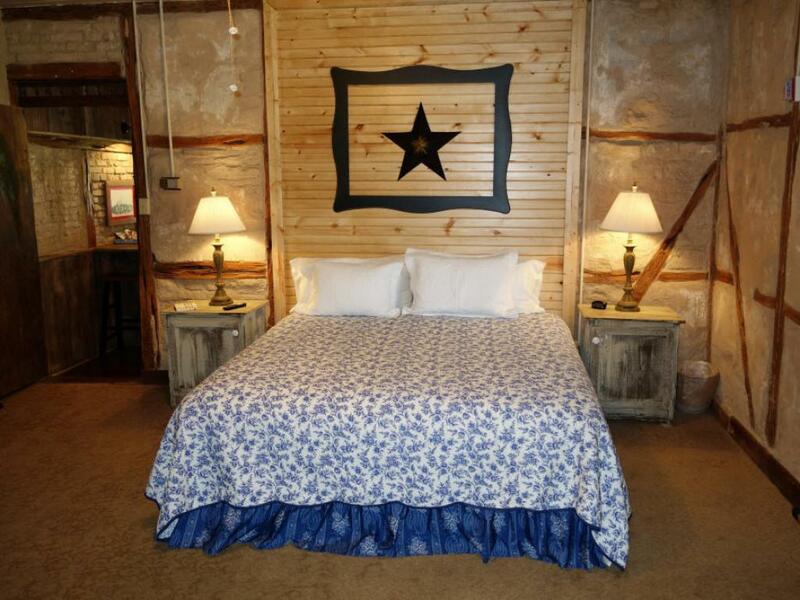 The Spirit of Texas resides here - it's cozy and romantic, just what you need to keep "the real world" at bay. 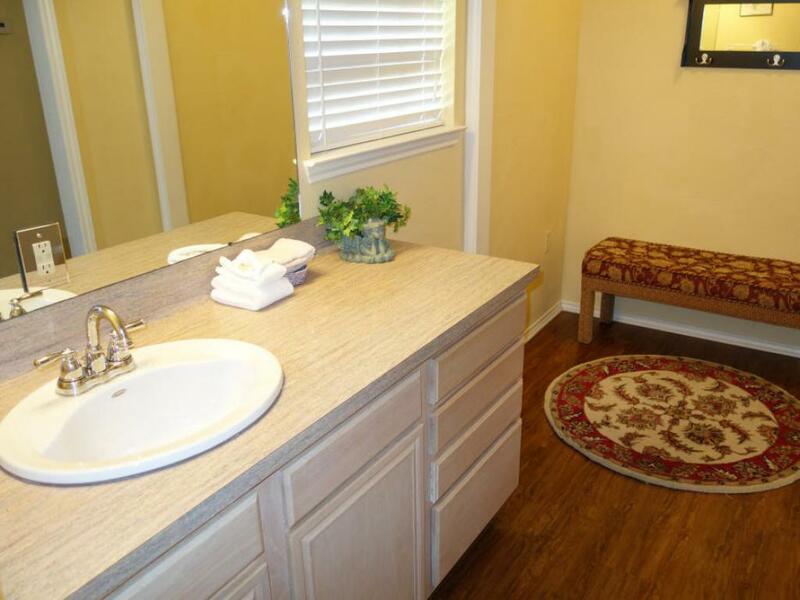 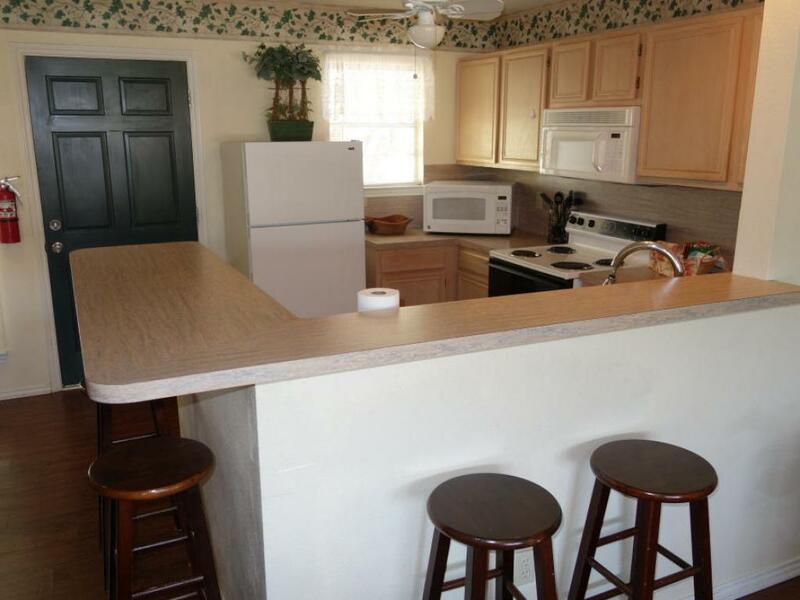 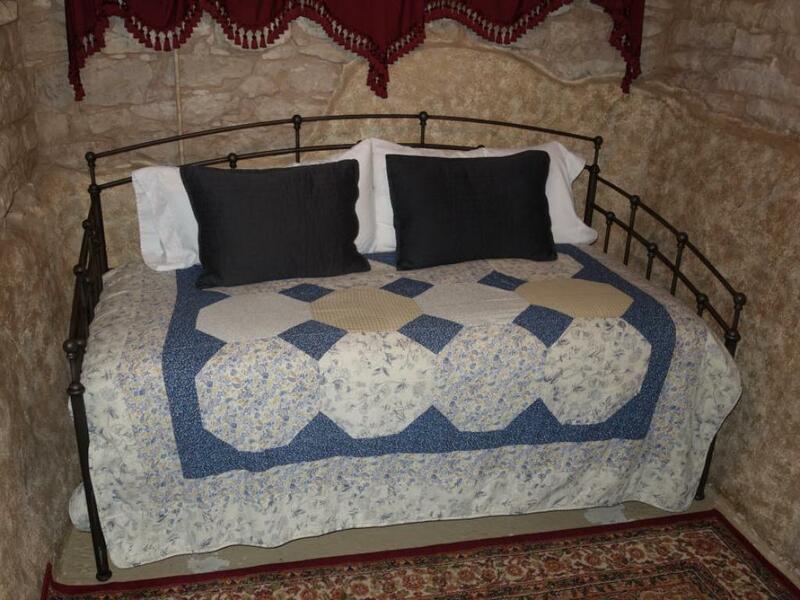 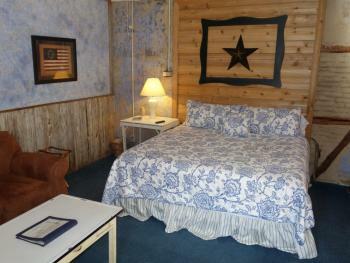 Recently remodeled, The Bluebonnet Room is a comfortable unit that can accommodate up to 2 people. 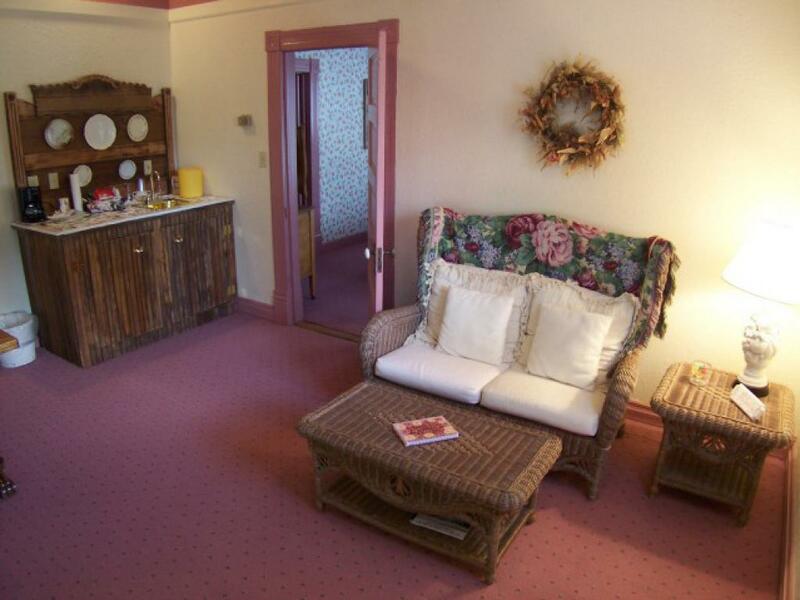 It has a hotel-style connecting door that leads to The Yellow Rose Suite. 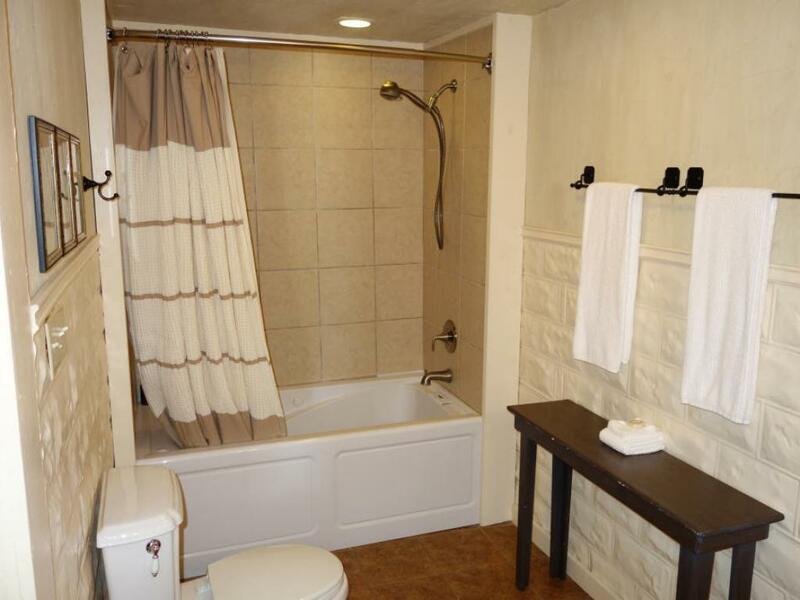 $165.00 Sun-Thurs / $195.00 Fri, Sat, & holidays King bed, Jacuzzi bathtub with stand-up shower, sitting area with dining/writing table, refrigerator, microwave. 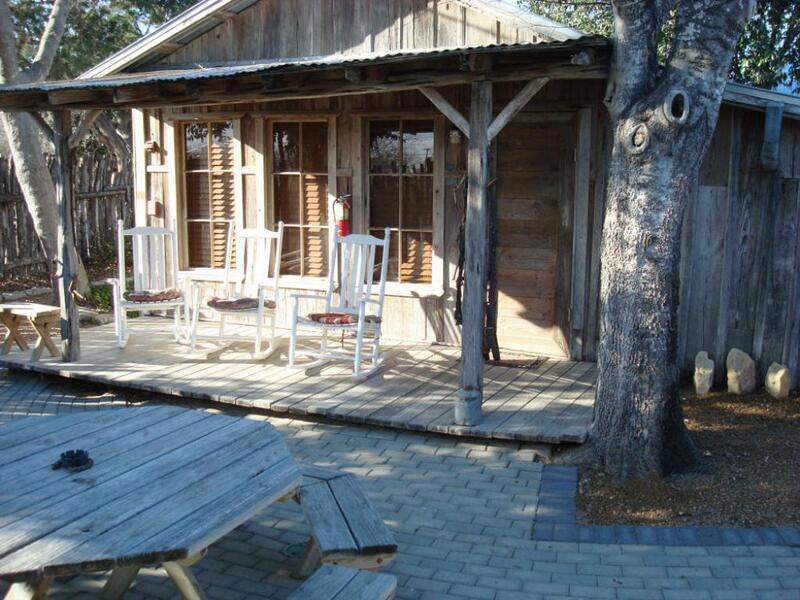 The Cottage is the what used to be the carriage house for the Faust House at Gruene Homestead Inn. 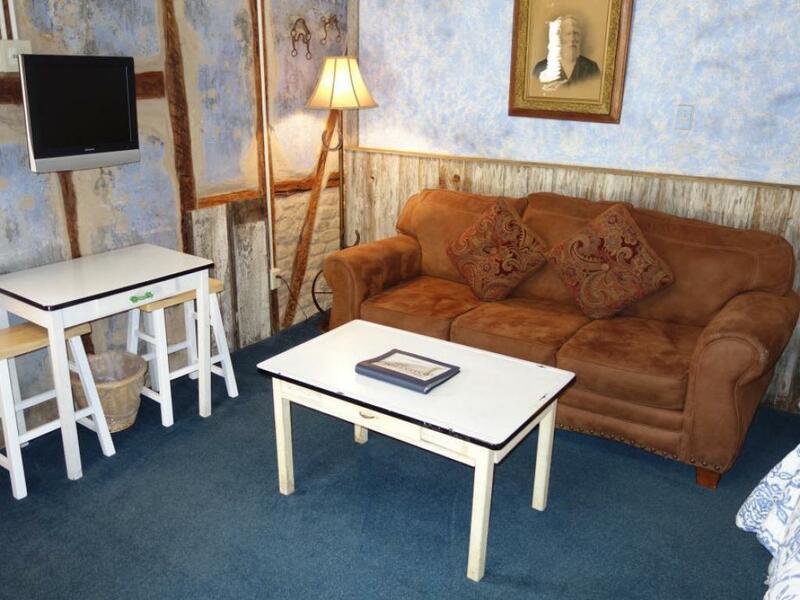 Is it now a free standing guest unit located behind the Faust House, right in the middle of our main property. 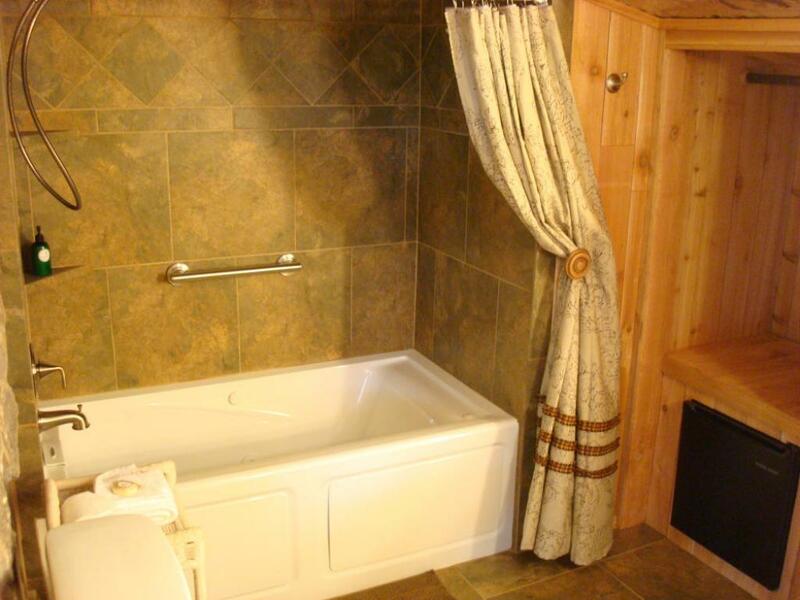 This unit is very popular because it has lot's of space, plenty of privacy, a double Jacuzzi bath tub, and a walk-in shower. 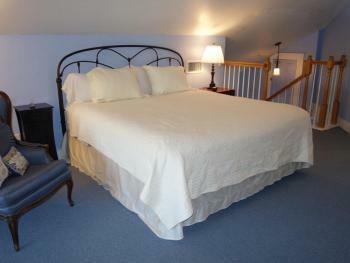 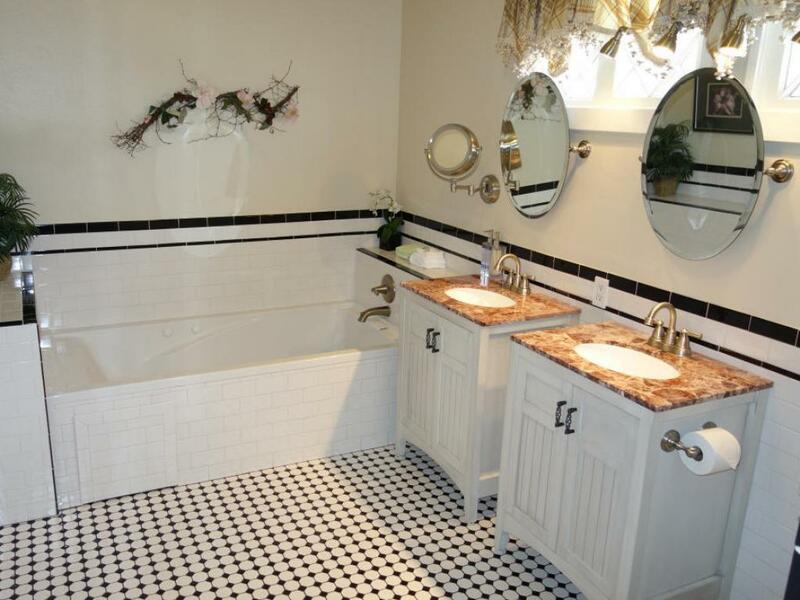 The Cottage was recently renovated and can accommodate 2 adults and 1 small child. $185.00 Sun-Thurs / $225.00 Fri, Sat, & holidays King size bed, double Jacuzzi bathtub, walk in shower, sitting area with sofa, dining/writing table, refrigerator, private porch, stand alone unit. 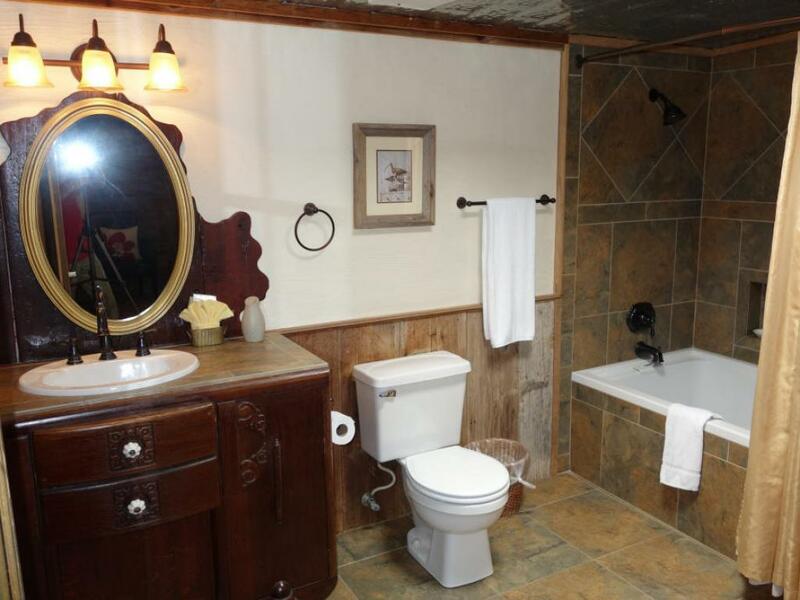 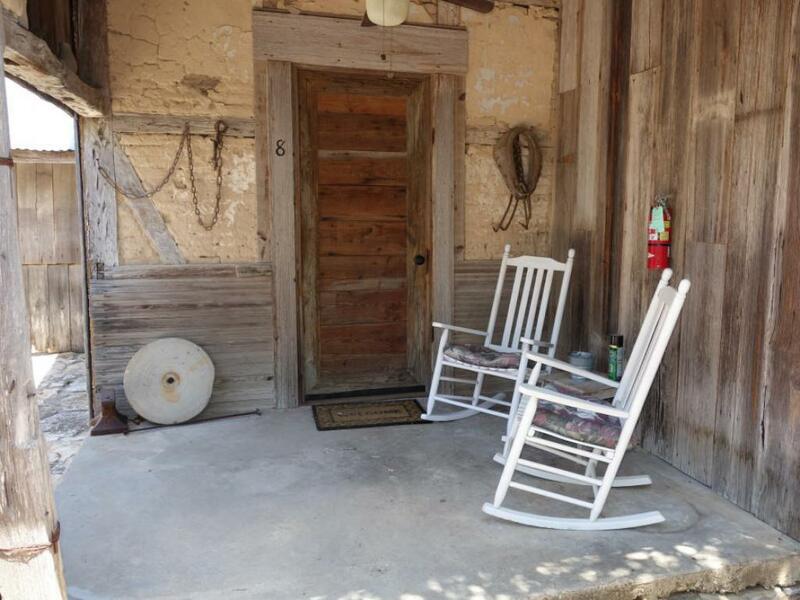 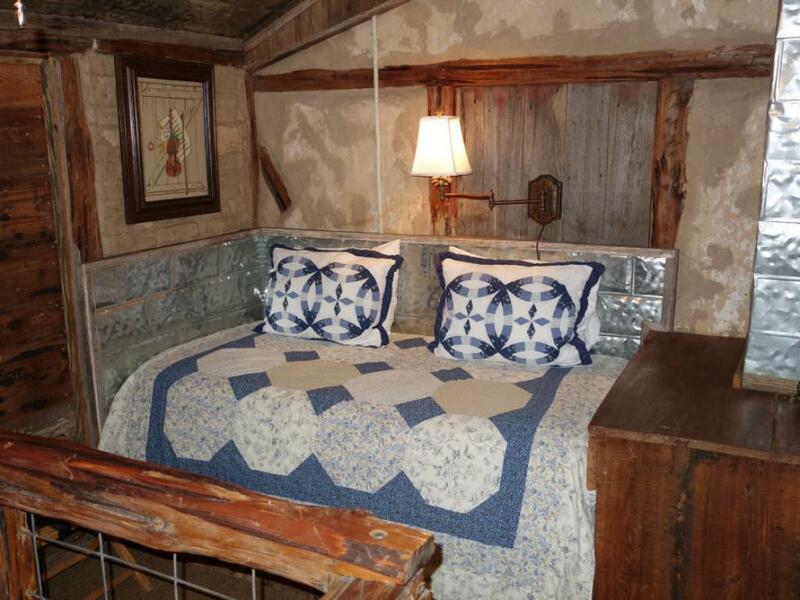 The Silo is one of the most distinctive units available at Gruene Homestead Inn. 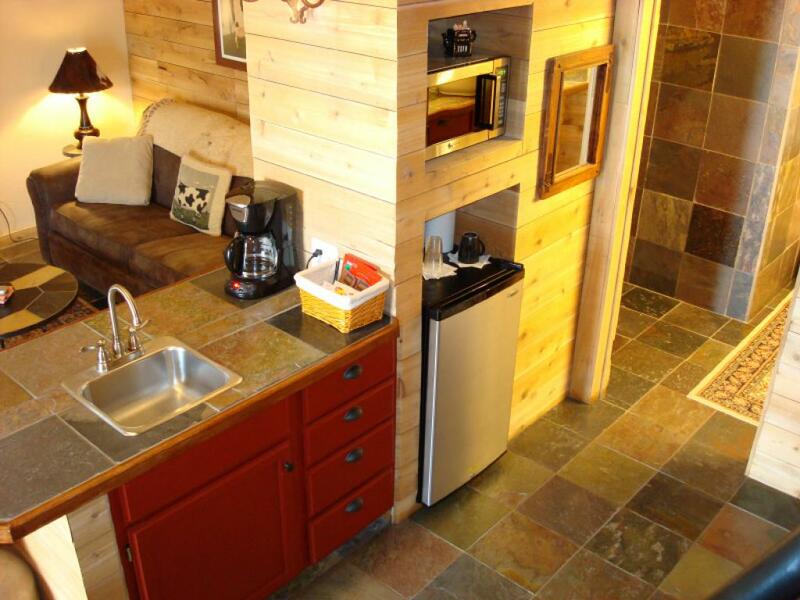 So much so that it has garnered some degree of notoriety in "tiny house" circles. 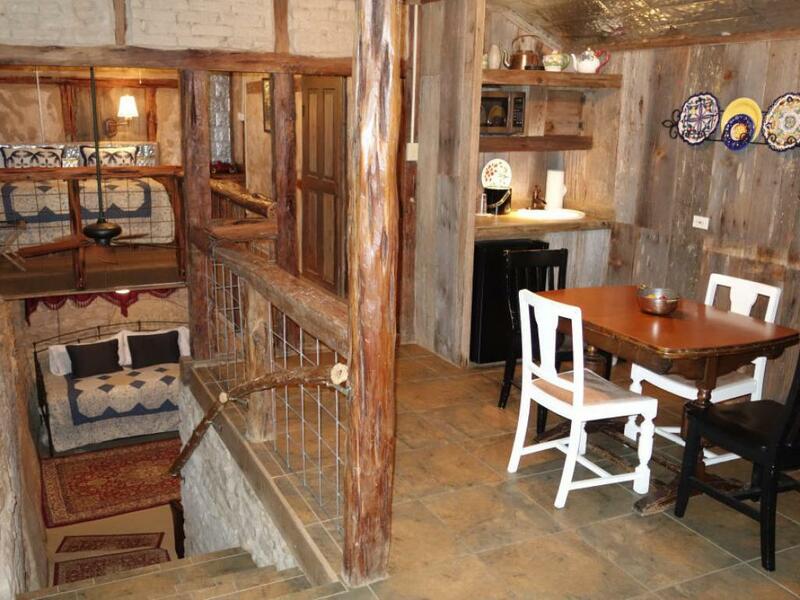 It is essentially a 1 bedroom loft apartment built into a 1940's grain silo. 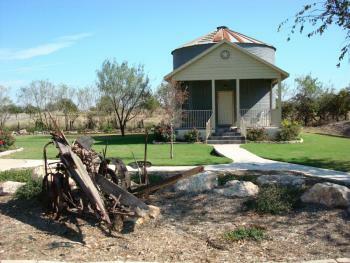 The silo had been owned by Edwin Hanz and was initially located just off the back side of the original property. 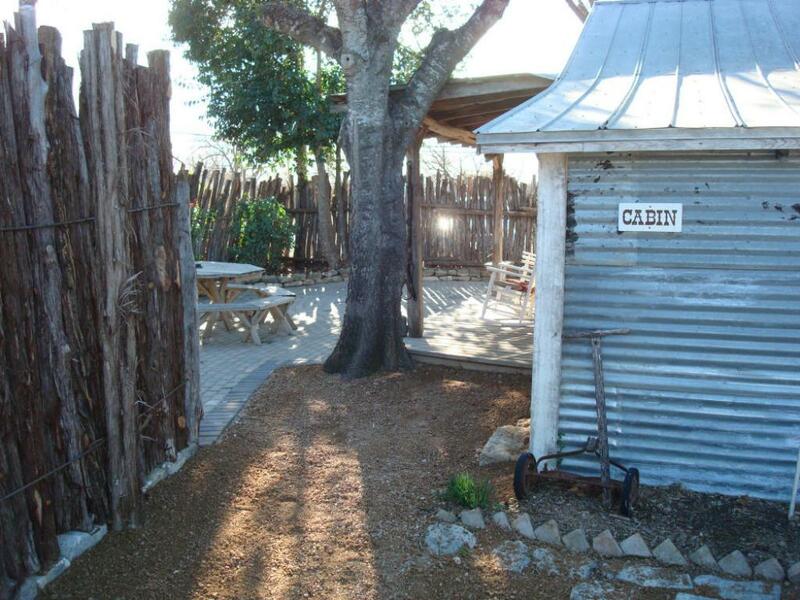 Frequent guests of Gruene may recognize the structure itself as the "Gruene Silo Inn" that was owned by friends of the Miles family. 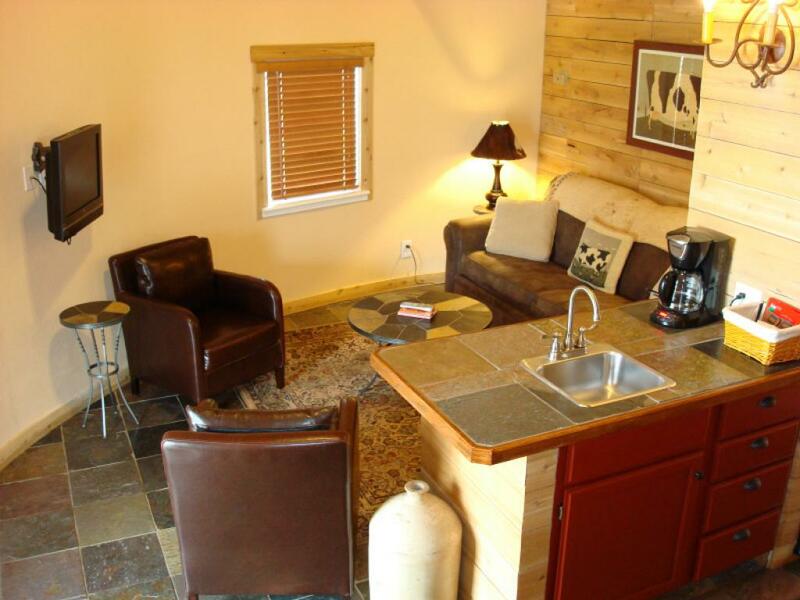 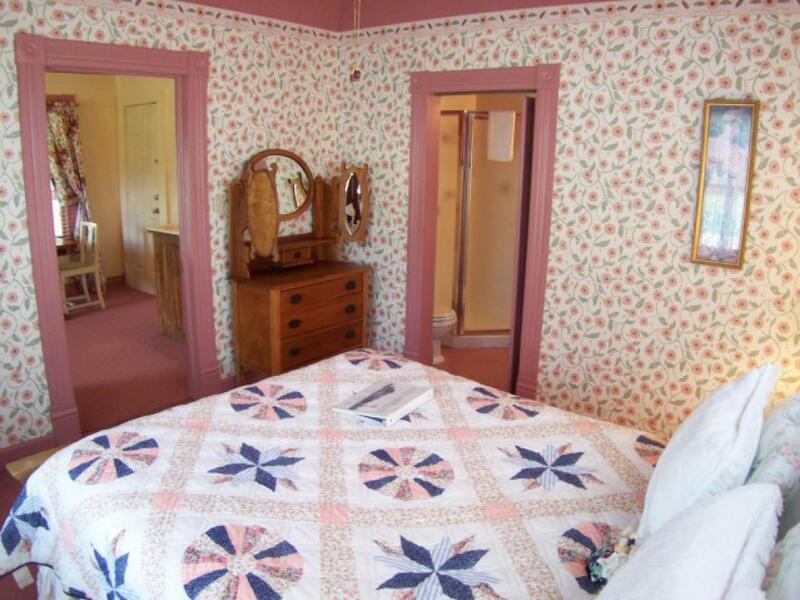 The Silo was moved, and remodeled, in 2007 and has become one of the most popular units at the Inn. 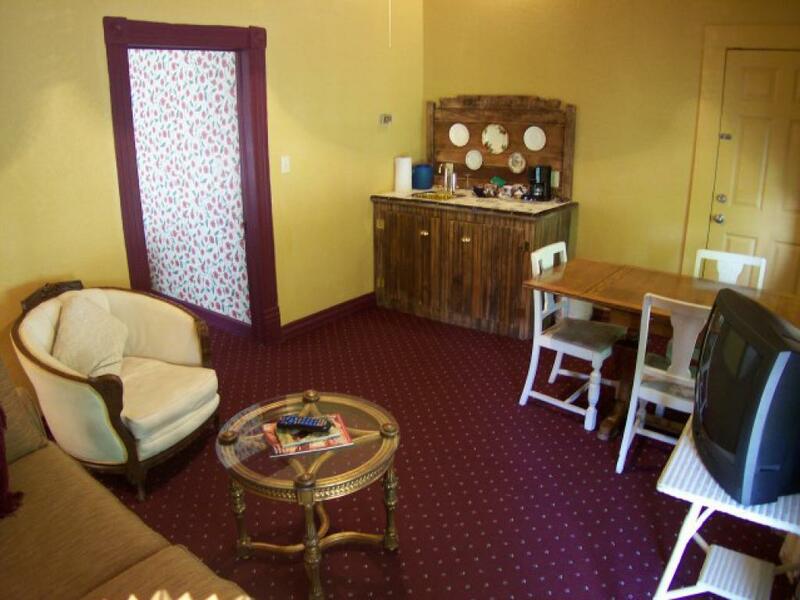 This unit has a very upscale feel and is quite a unique lodging experience. $195.00 Sun-Thurs / $235.00 Fri, Sat, & holidays King bed upstairs in loft, twin day bed with trundle (real mattresses) in living area, stand up shower, 2 sinks, wet bar, microwave, refrigerator, private porch. 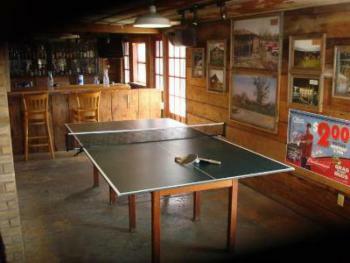 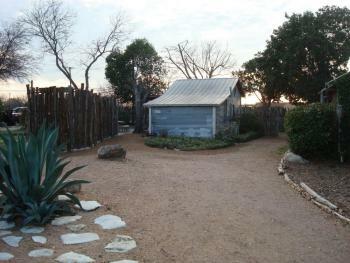 The Ranch House was originally a private residence built on the back side of the Gruene Homestead Inn in the mid 1990's. 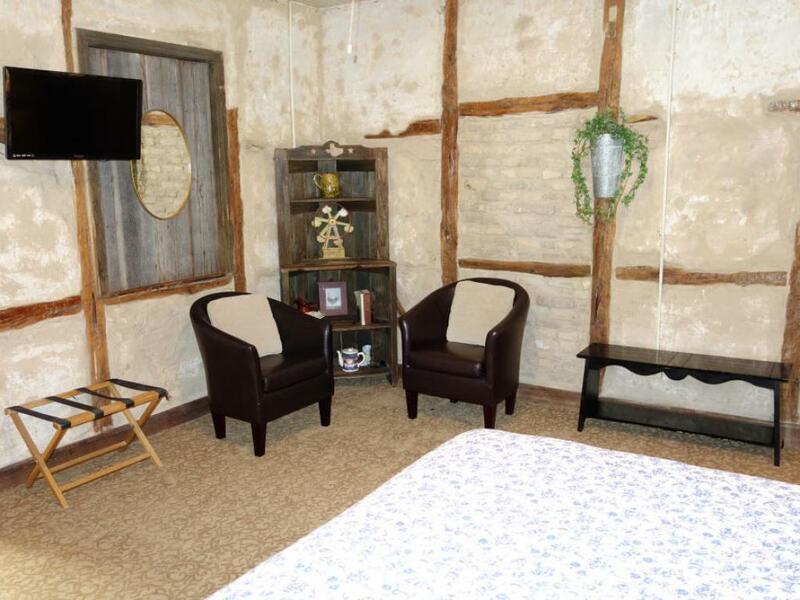 It is a one bedroom house that is fully equipped to accommodate a maximum of 5 people. 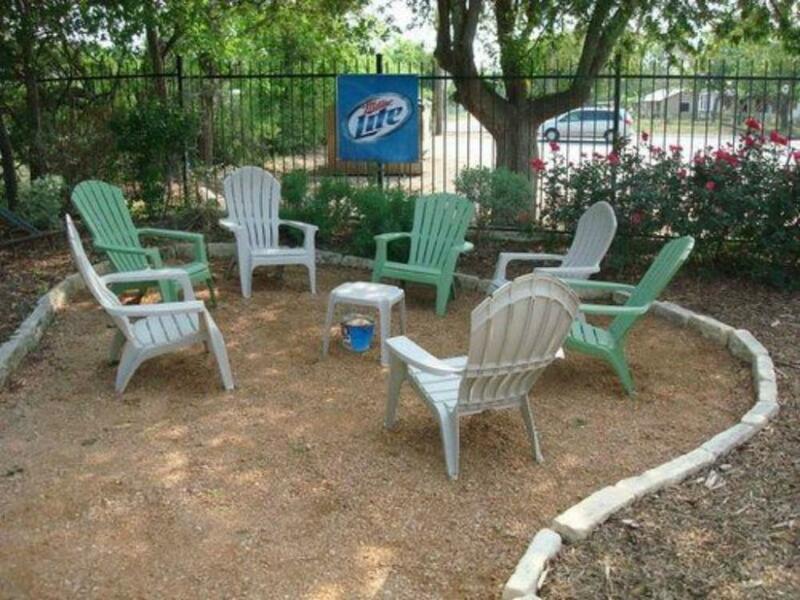 When planning a group event, this is the perfect starting point. 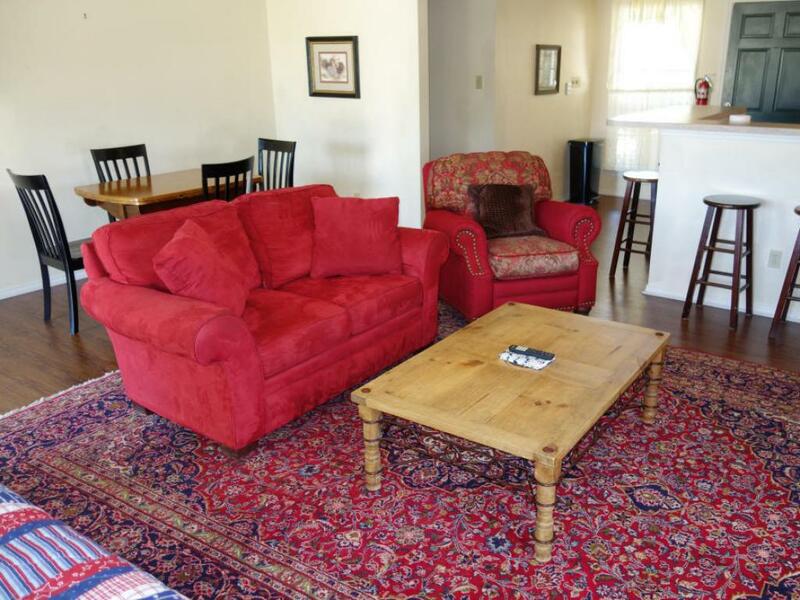 The living room in this house is quite large and is appropriate for informal meetings of up to 12 people. 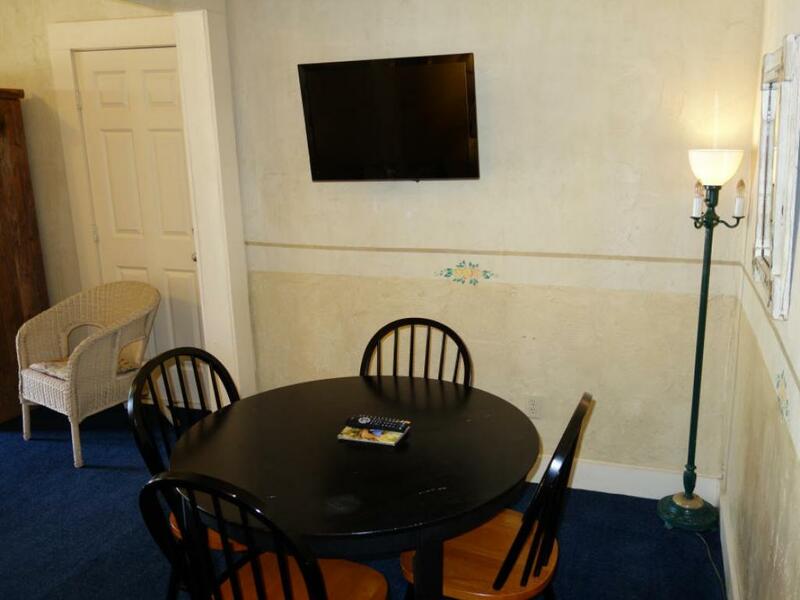 $225.00 Sun-Thurs / $265.00 Fri, Sat, & holidays King size bed in bedroom, day bed with trundle bed in living room (real mattresses), twin roll-away bed stored in closet, large living room with big TV, traditional bathtub with stand up shower, full kitchen with stove and large refrigerator, 2 private porches, picnic area, gas BBQ grill, close parking. 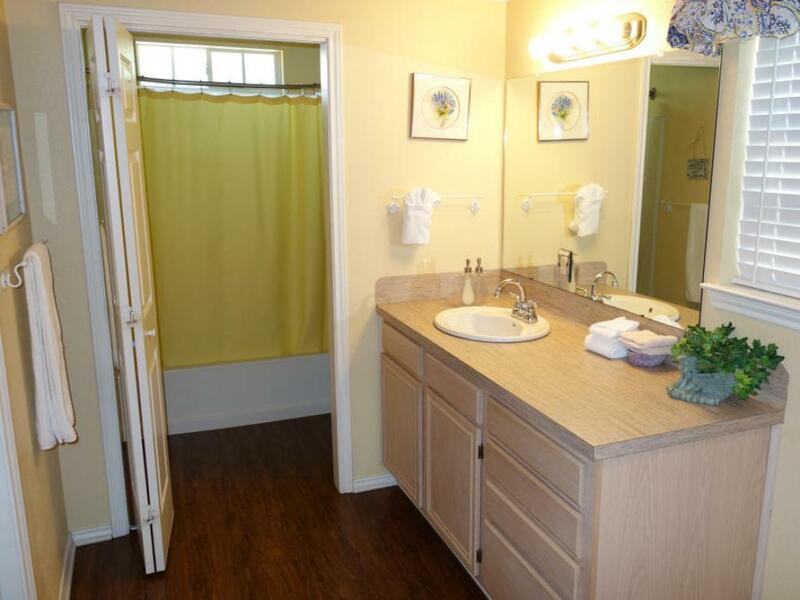 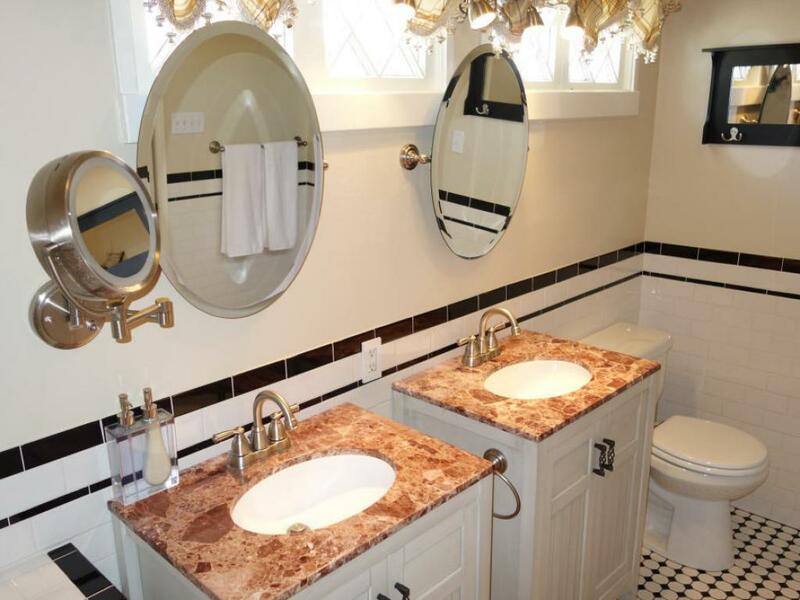 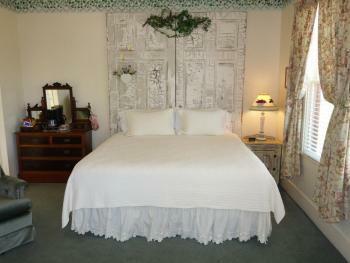 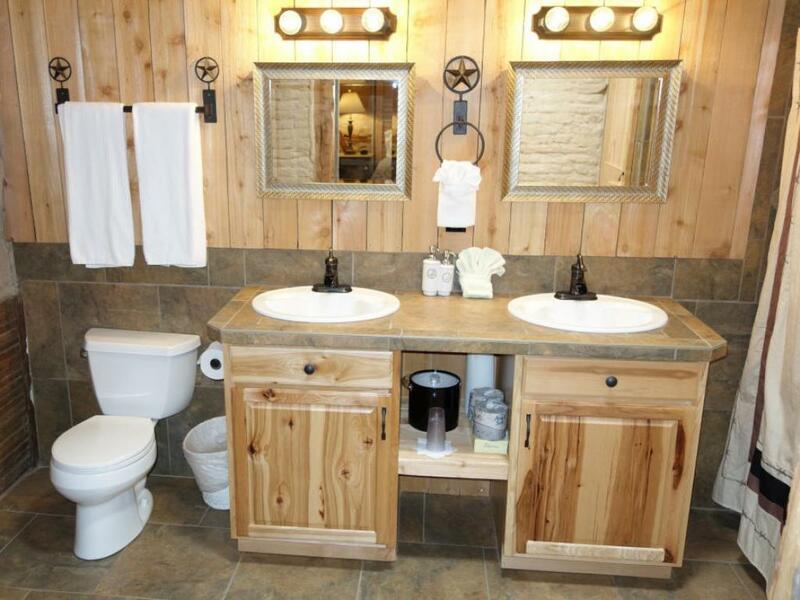 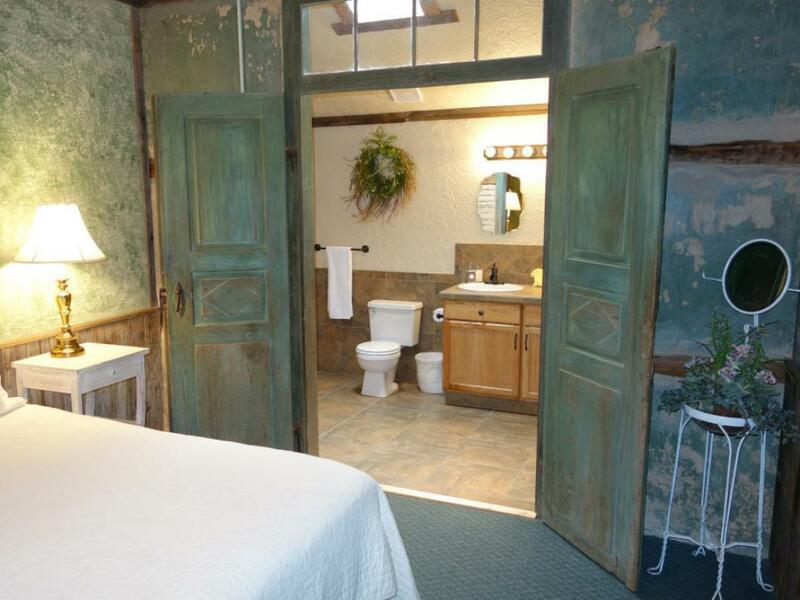 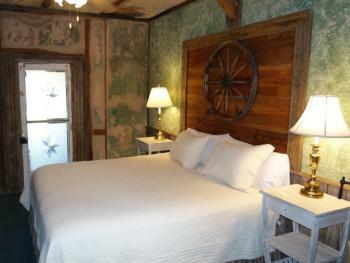 Recently remodeled, The Yellow Rose Suite is a very popular unit at Gruene Homestead Inn. 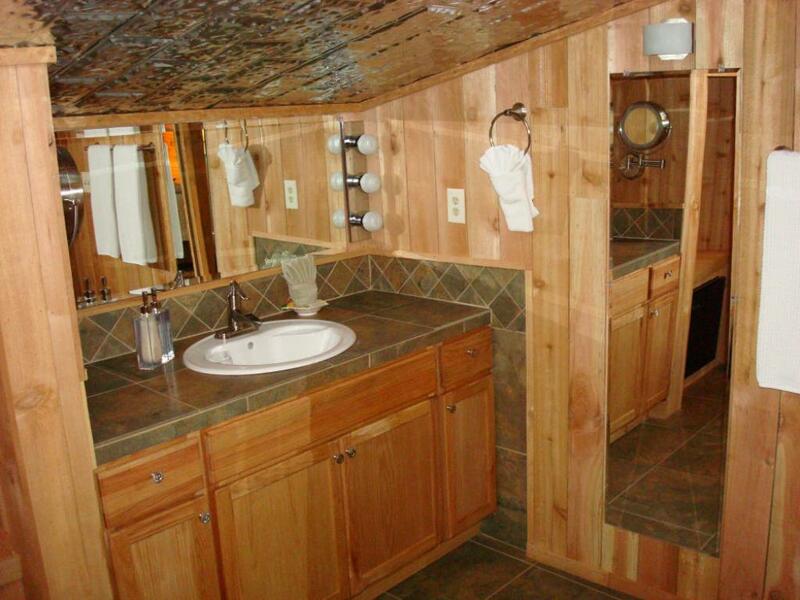 The vaulted ceilings convey a feeling of freedom. 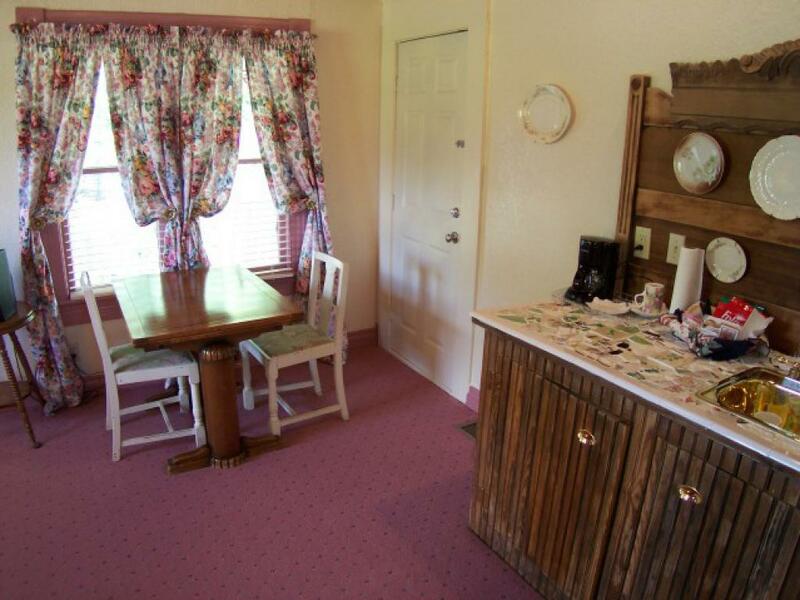 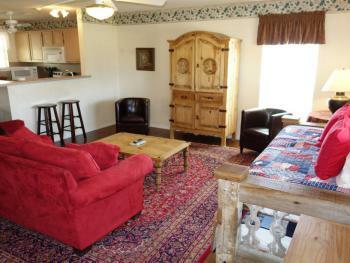 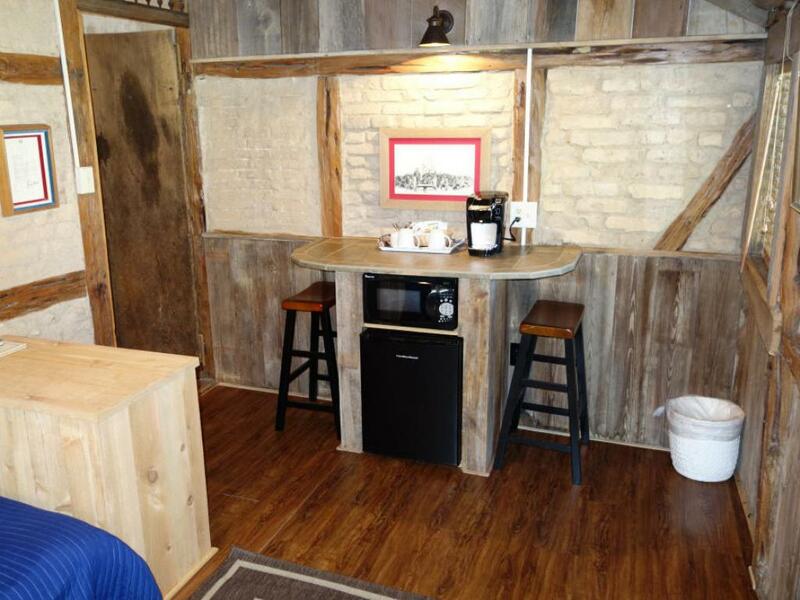 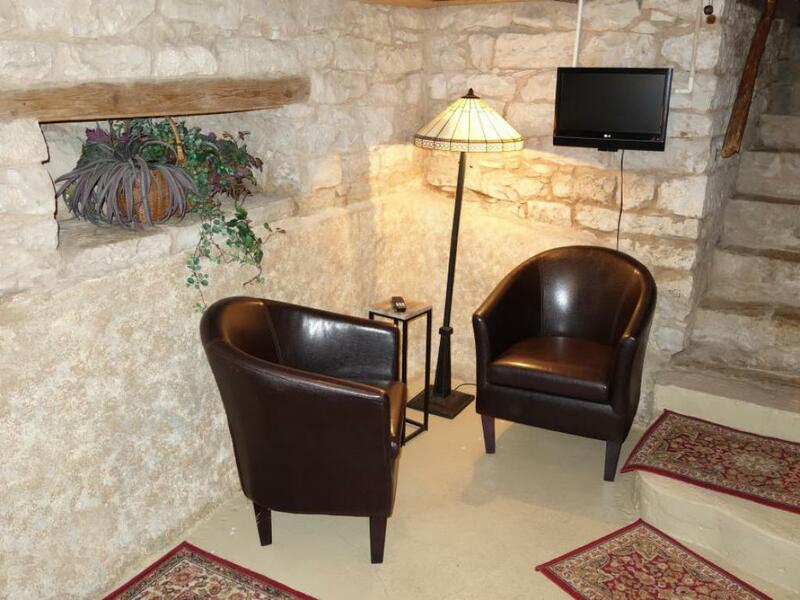 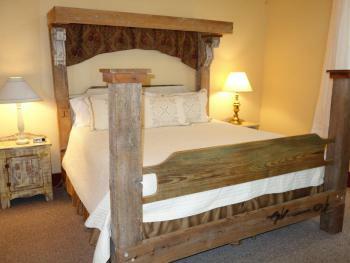 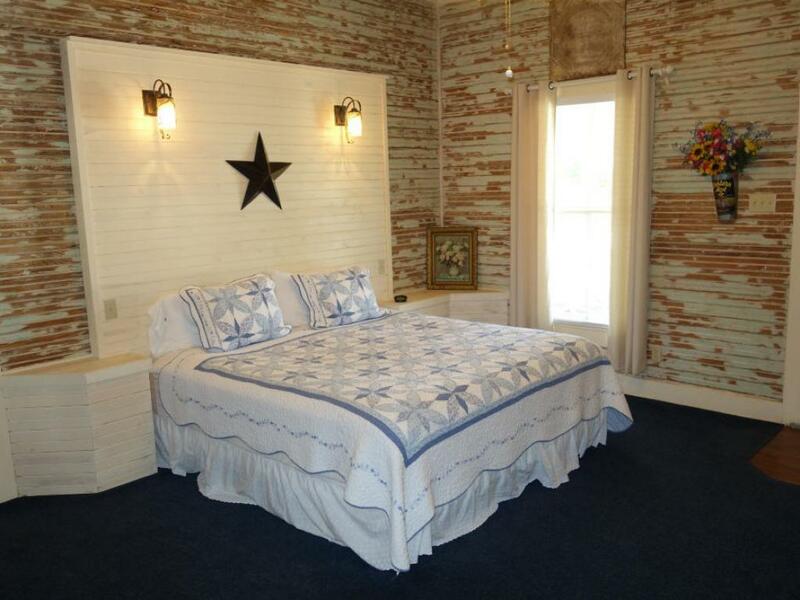 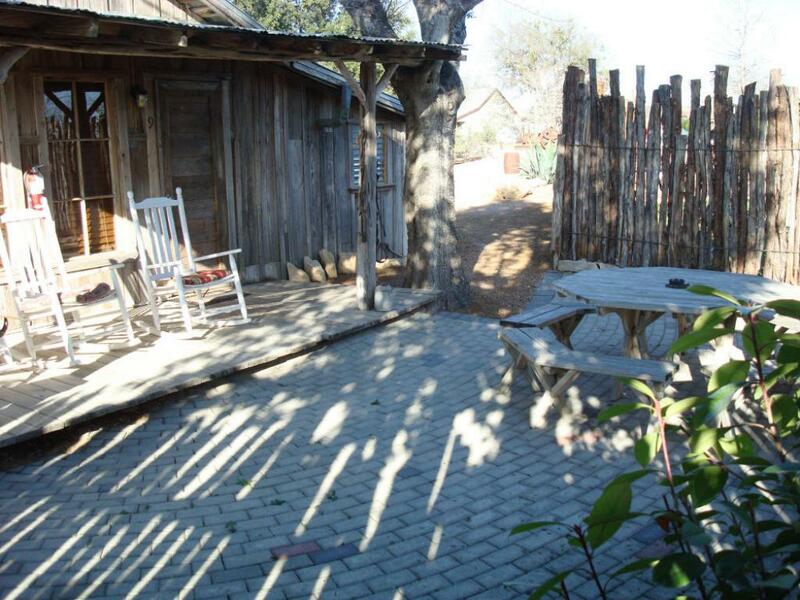 This is a nice mini-suite and can accommodate up to 4 people and is conveniently locate close to Tavern in the Gruene. 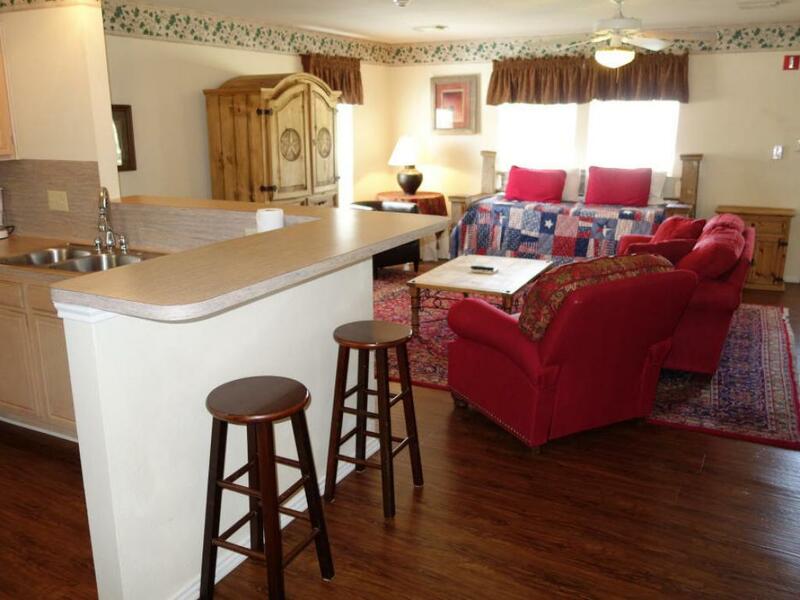 This unit has a hotel-style connecting door that leads to The Bluebonnet Room. 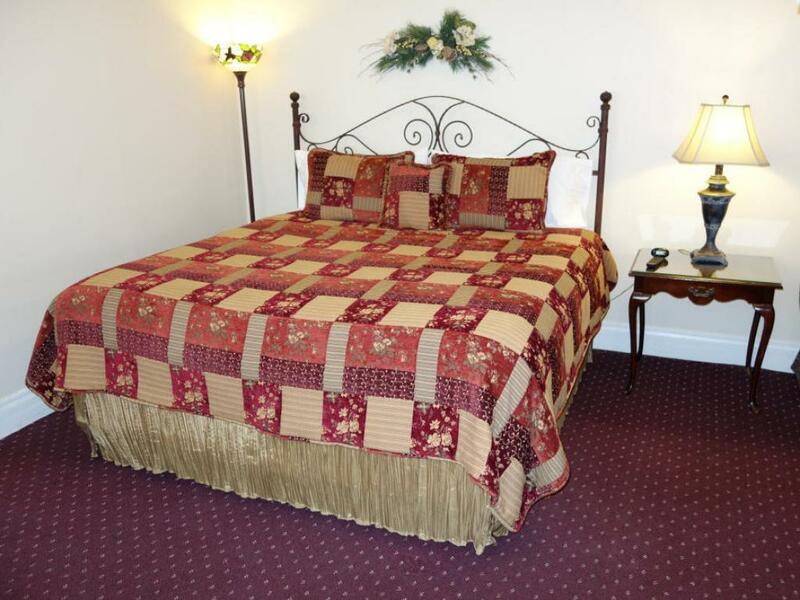 $175.00 Sun-Thurs / $210.00 Fri, Sat, & holidays King bed, day bed with trundle (2 twin size real mattresses), Jacuzzi bathtub with stand-up shower, sitting area with dining/writing table, refrigerator, microwave. 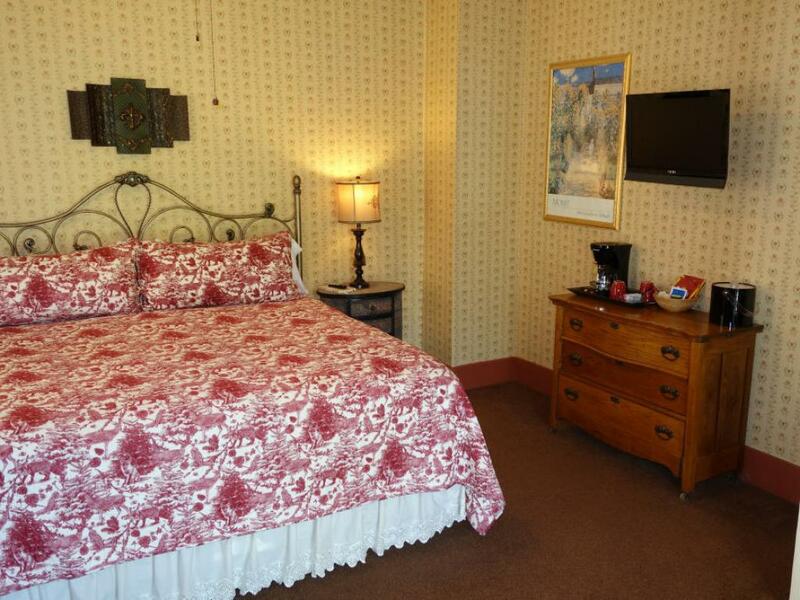 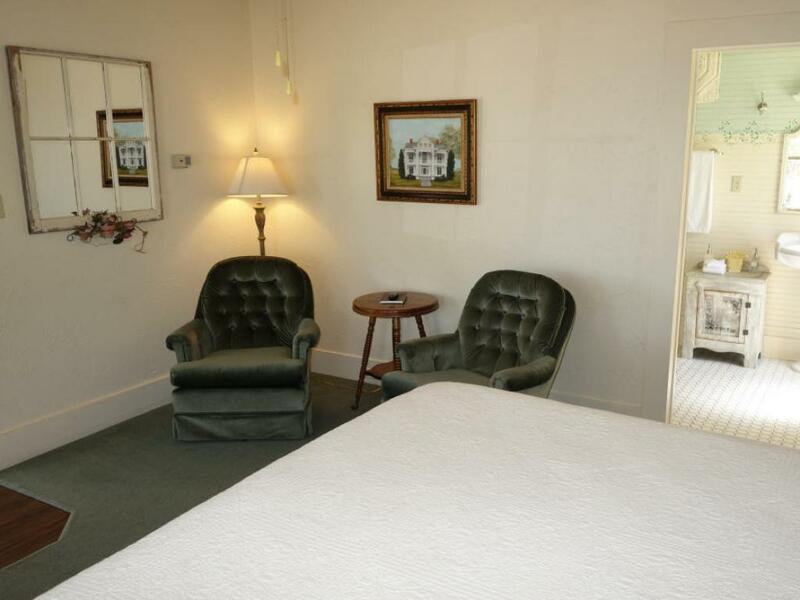 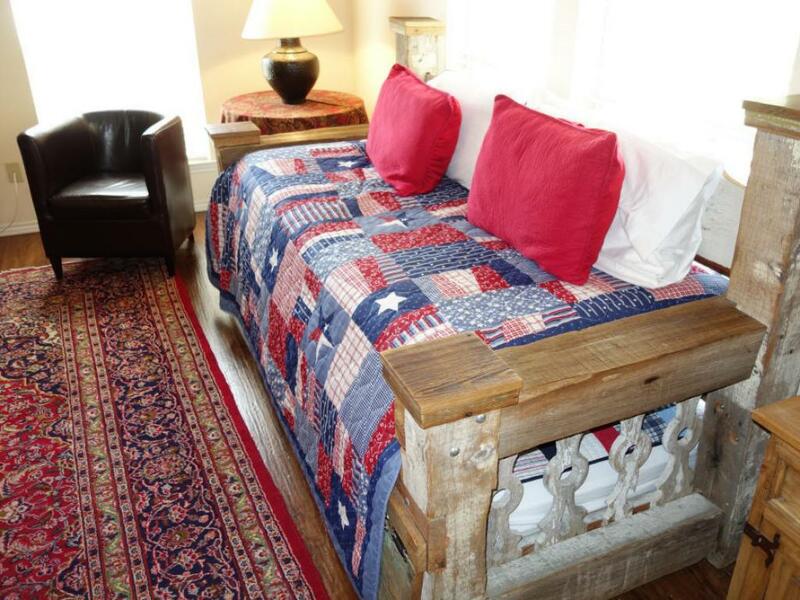 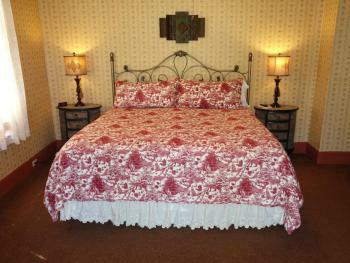 The Lady Banks Suite is a very cozy, two room guest unit that has a distinctly Texas Victorian-style charm. 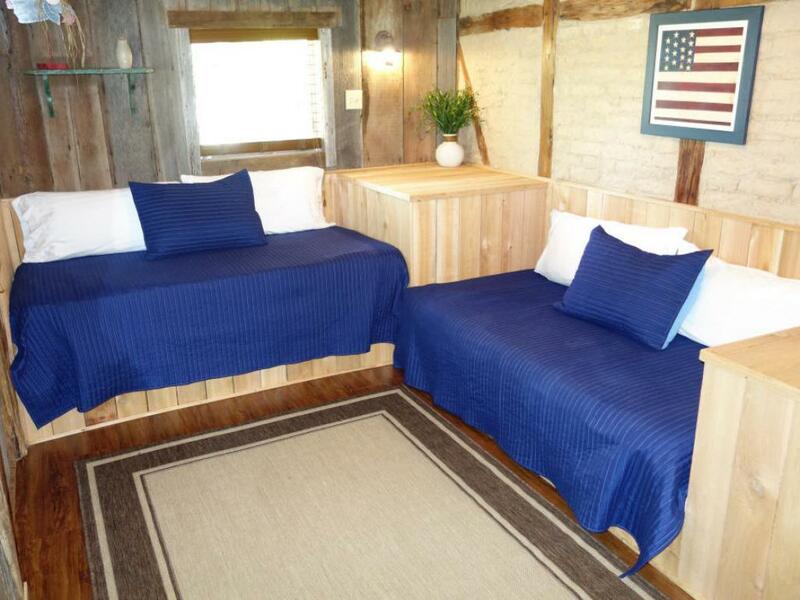 It can accommodate 2 adults. 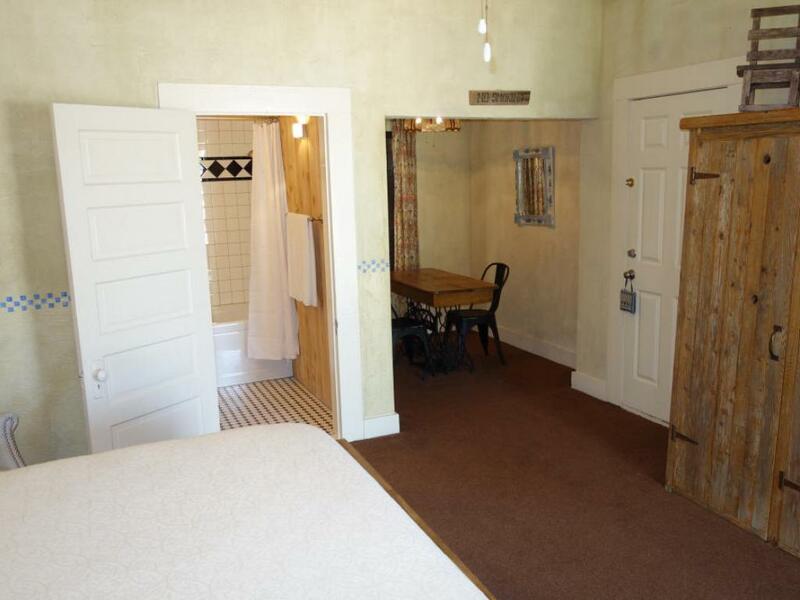 This unit has a hotel-style connecting door that leads to The Belinda Suite. 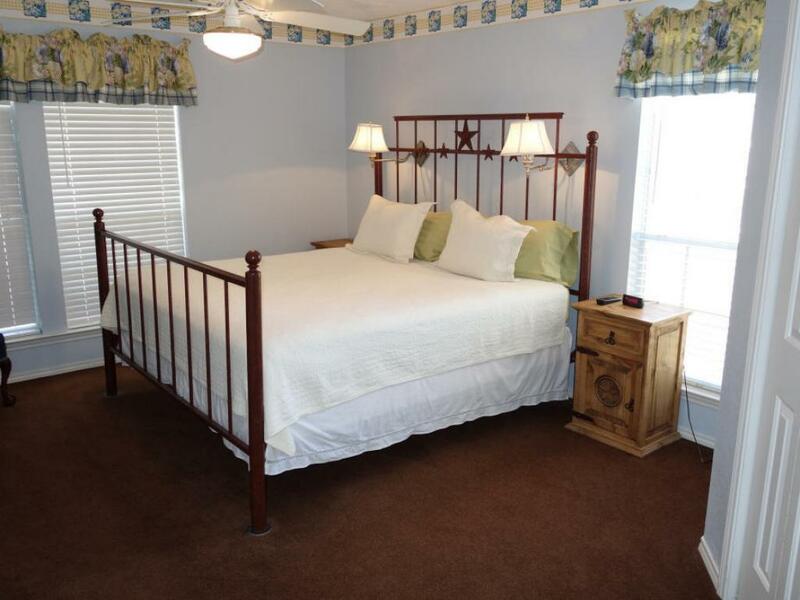 $165.00 Sun-Thurs / $195.00 Fri, Sat, & holidays Queen bed in bedroom, small stand up shower, living room, dining/writing table, wet bar, refrigerator, microwave oven, porch entrance with rocking chairs. 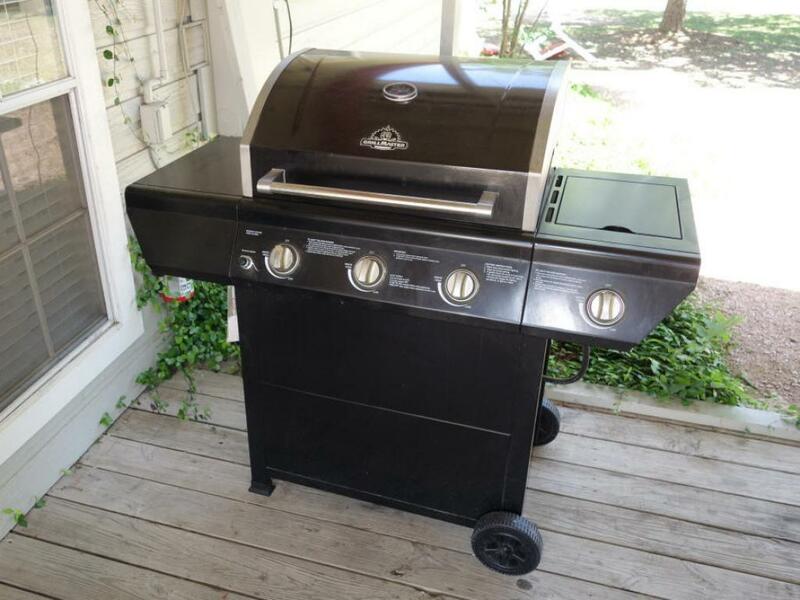 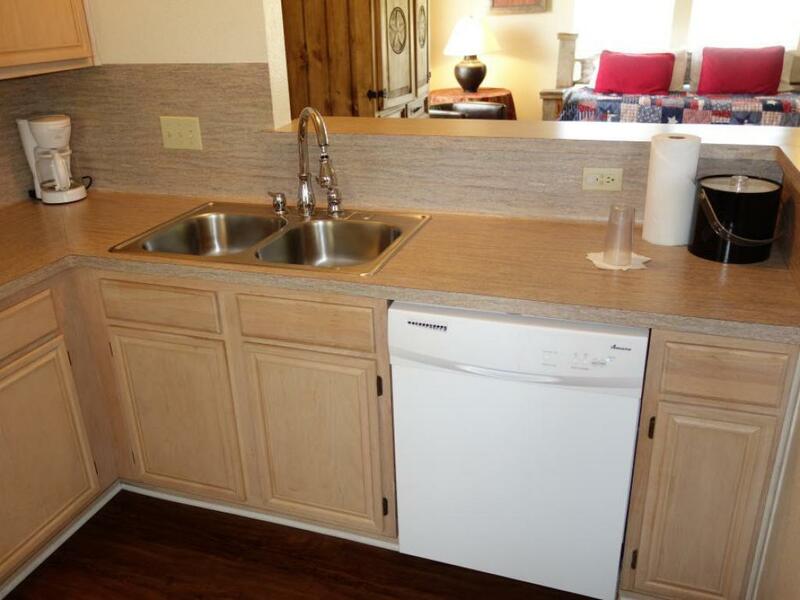 $165/$195, queen bed, shower, wet bar, refrigerator, microwave, upstairs. 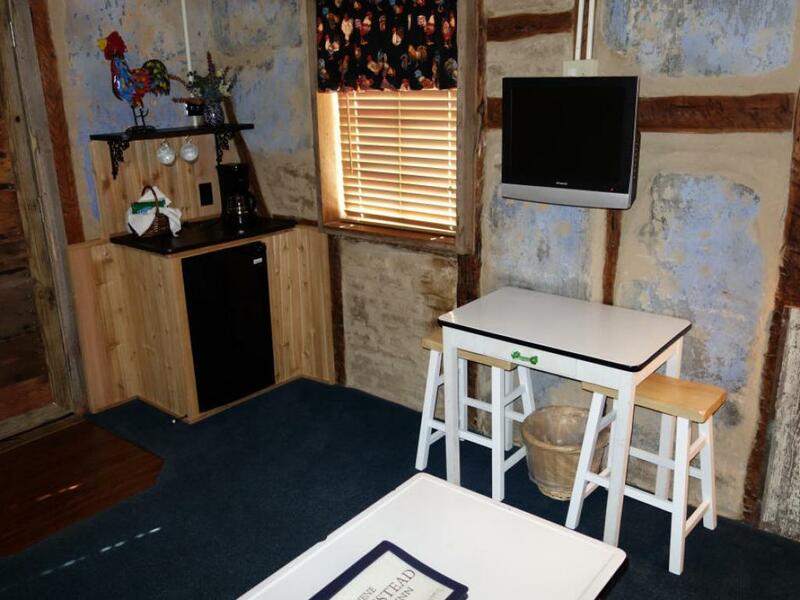 NOTE: This room can NOT accommodate 3 adults. 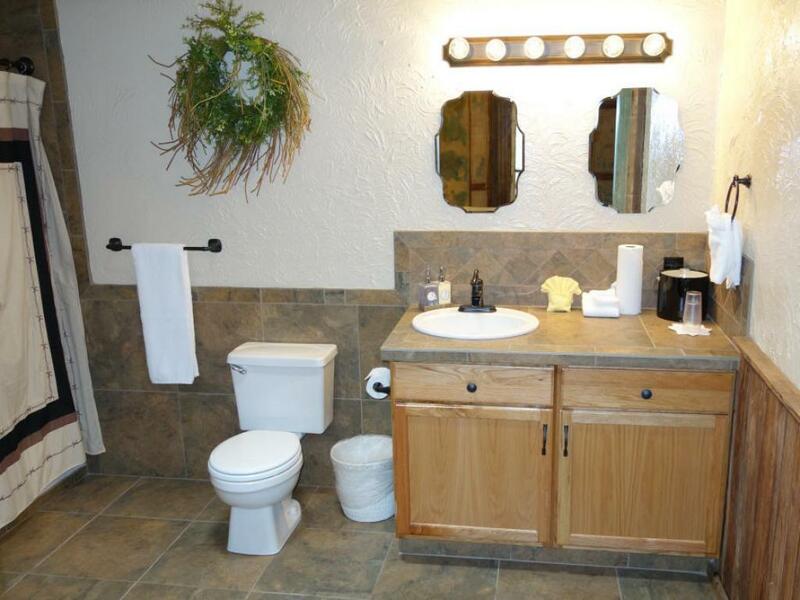 The third person must be a child age 12 years or younger. 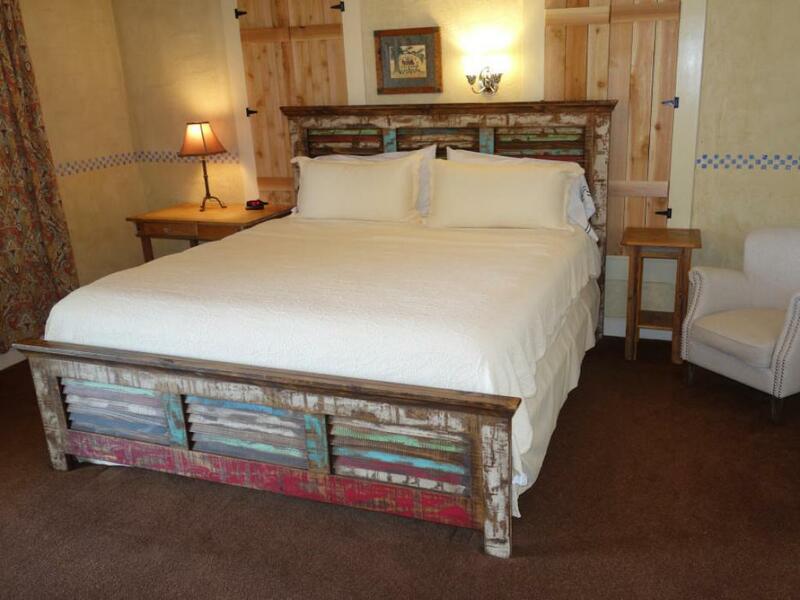 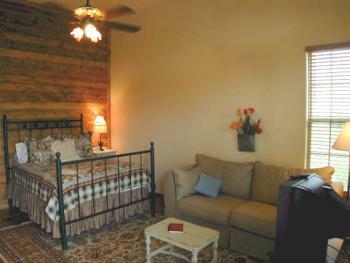 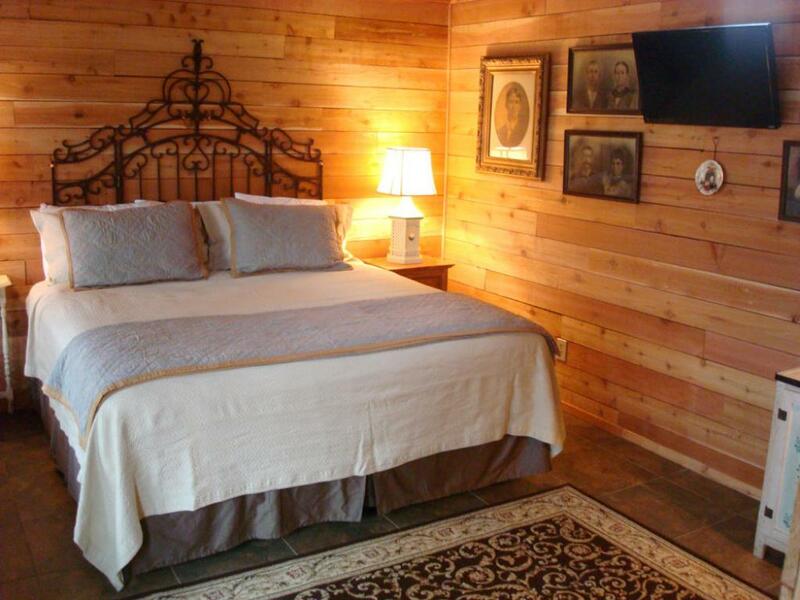 The Country Suite is one of the largest, and most comfortable, two room suites at Gruene Homestead Inn. 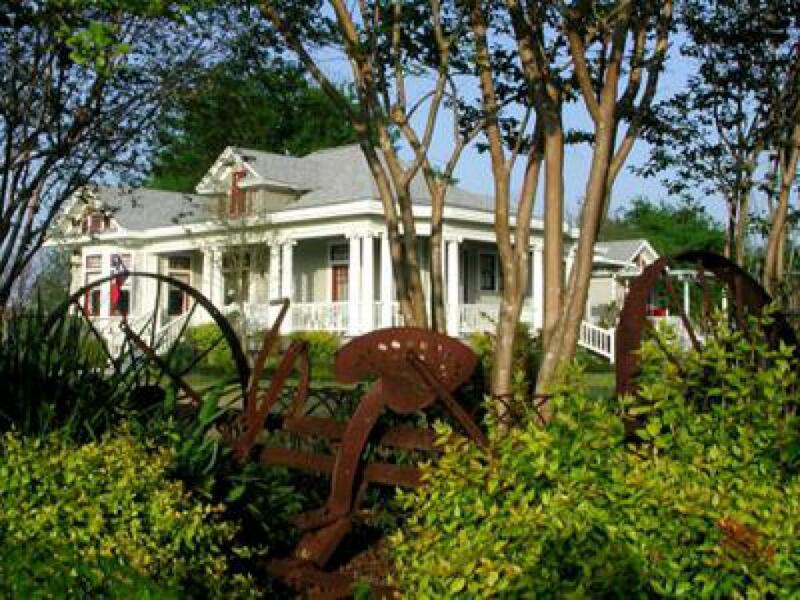 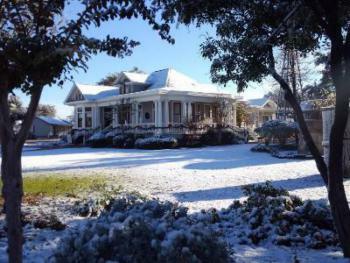 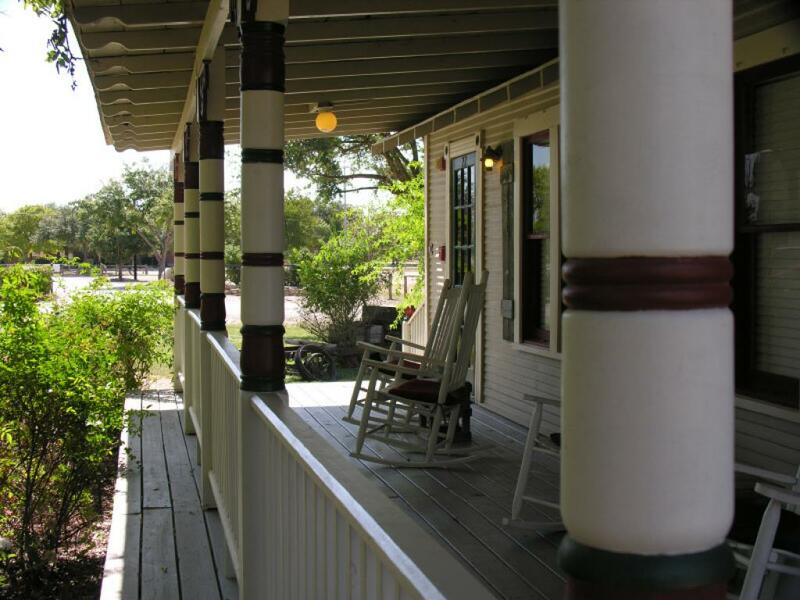 It is a beautiful example of early 1900's Texas Victorian style lodging and has plenty of room to stretch your legs and relax. 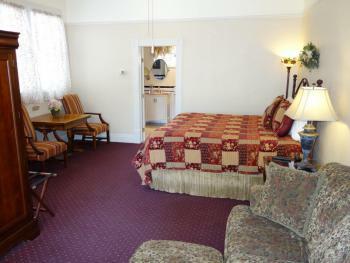 This room can accommodate up to 4 people. 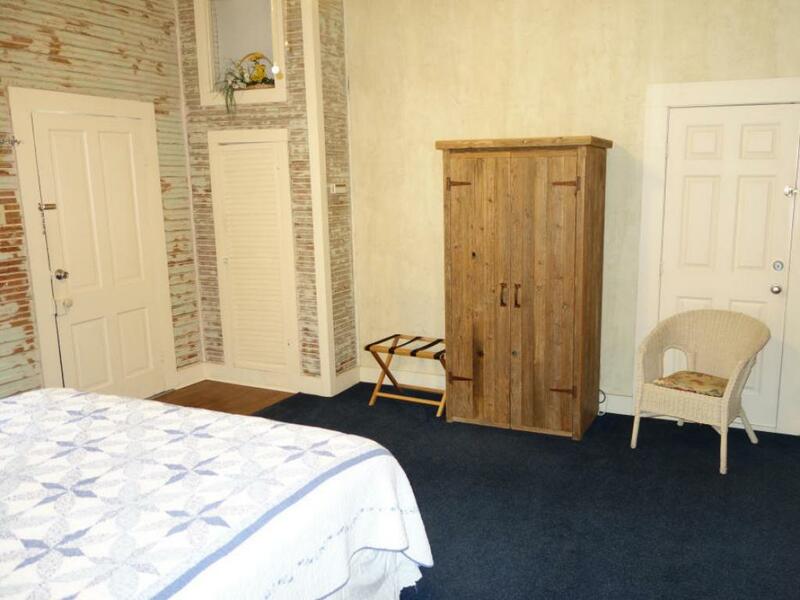 $175.00 Sun-Thurs / $210.00 Fri, Sat, & holidays Handmade king bed in master bedroom, day bed with trundle bed in living room (real mattresses), Jacuzzi bathtub with stand-up shower, dining table, wet bar with microwave oven and refrigerator. 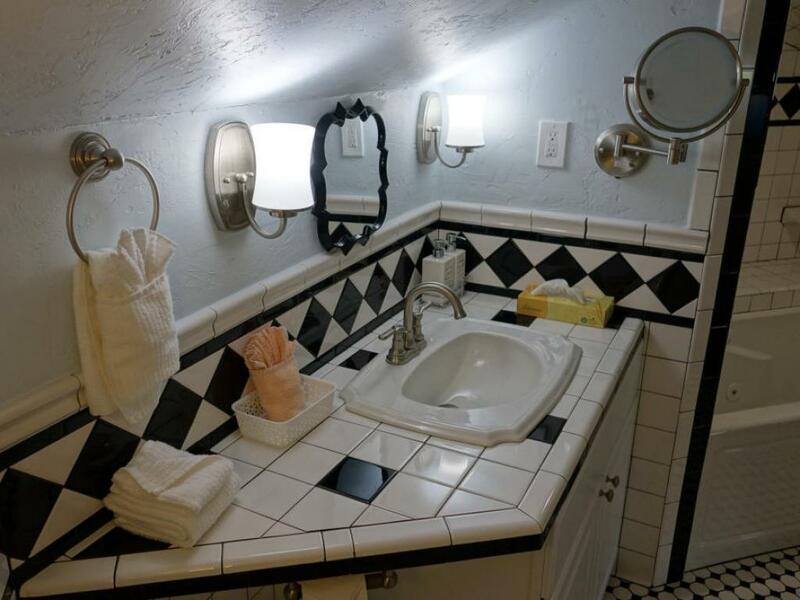 With it's sky blue ceiling and recently remodeled, old-fashion tile bathroom, Granny's Attic is a peaceful feeling upstairs room that can accommodate up to 2 adults. $165.00 Sun-Thurs / $195.00 Fri, Sat, & holidays King bed in one large room, Jacuzzi bathtub with stand-up shower, sitting area. 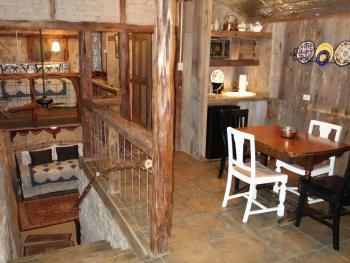 Upstairs. 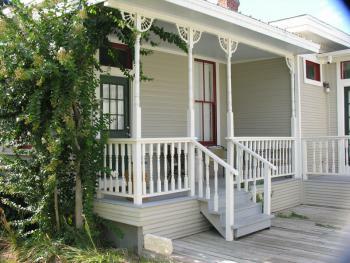 The Hideaway is the only unit located at the rear of the Farmhouse. 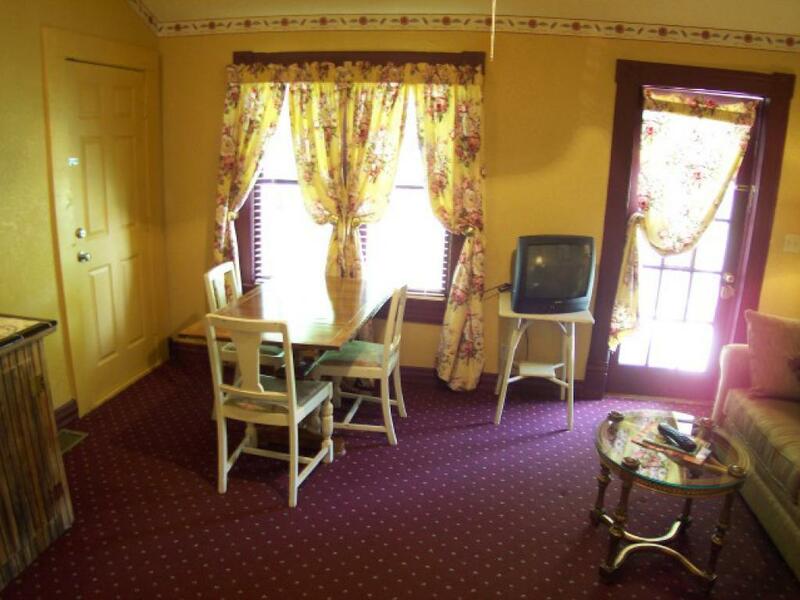 This room has close parking and a very private, fenced in courtyard porch. 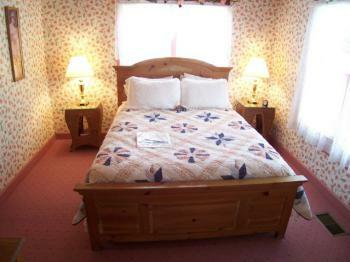 It is a large, comfortable room and can accommodate up to 2 people and 1 small child. 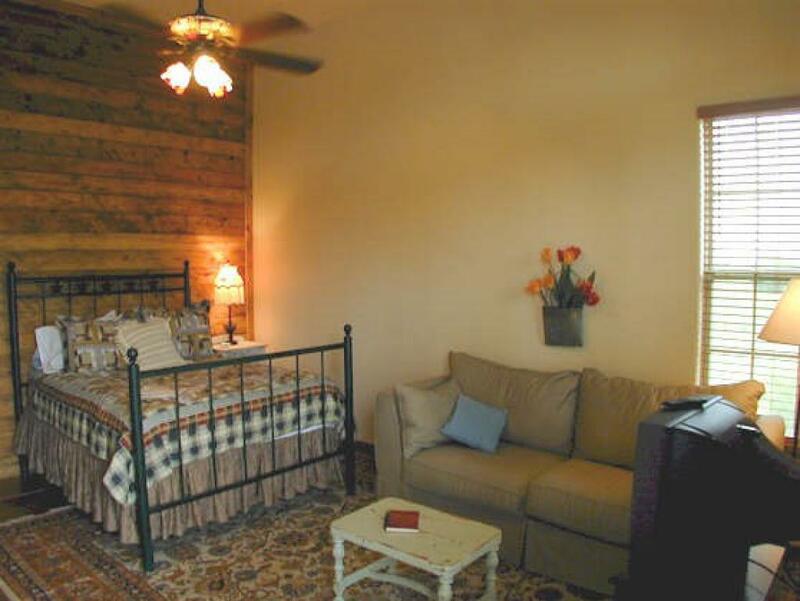 Pair this room up with the Cabin when booking for two couples as the two private porches are connected by a short path through a small garden. 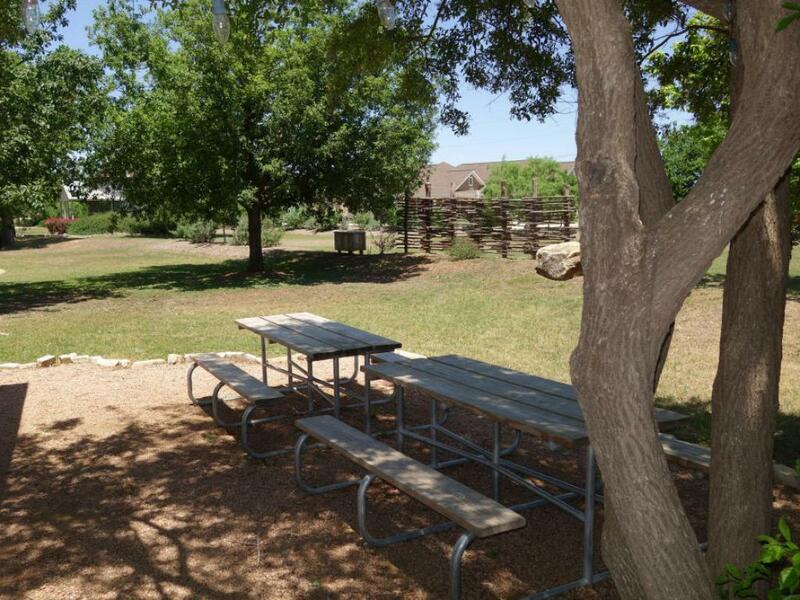 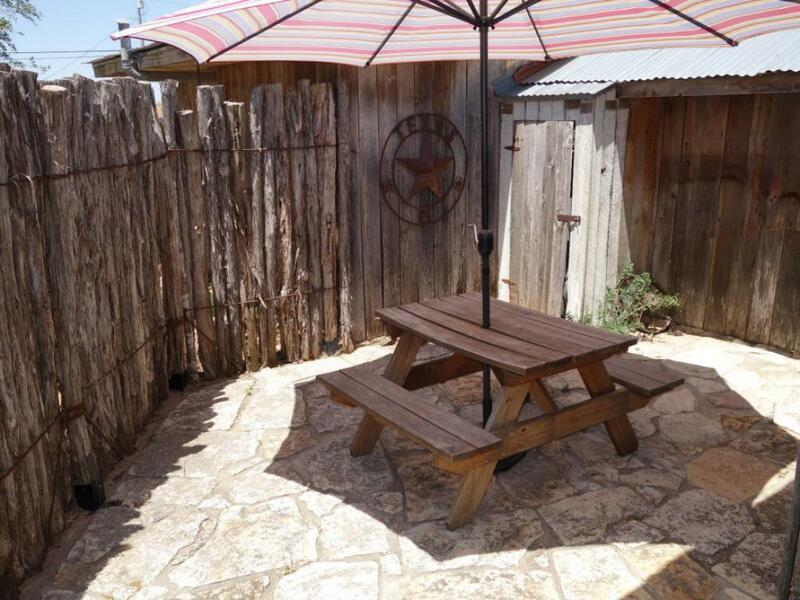 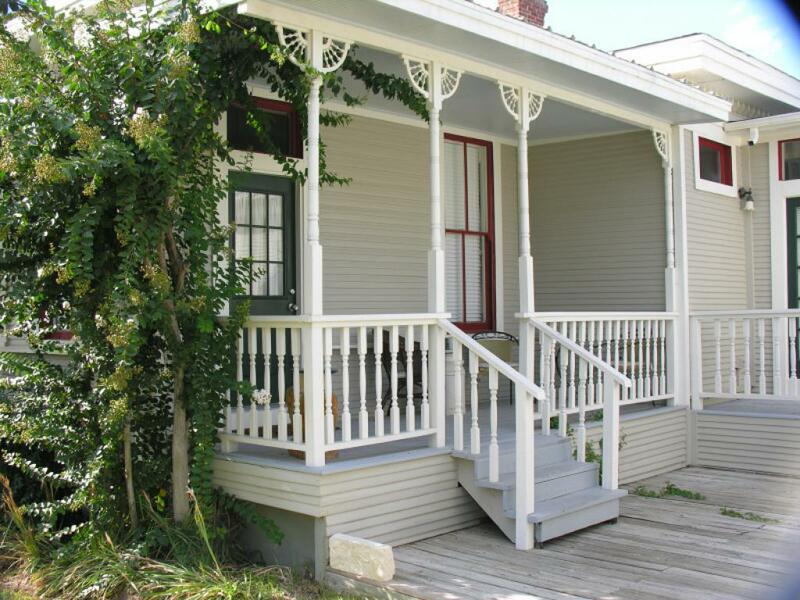 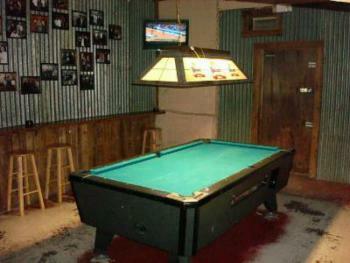 This unit has recently been renovated and is conveniently located close to Tavern in the Gruene. 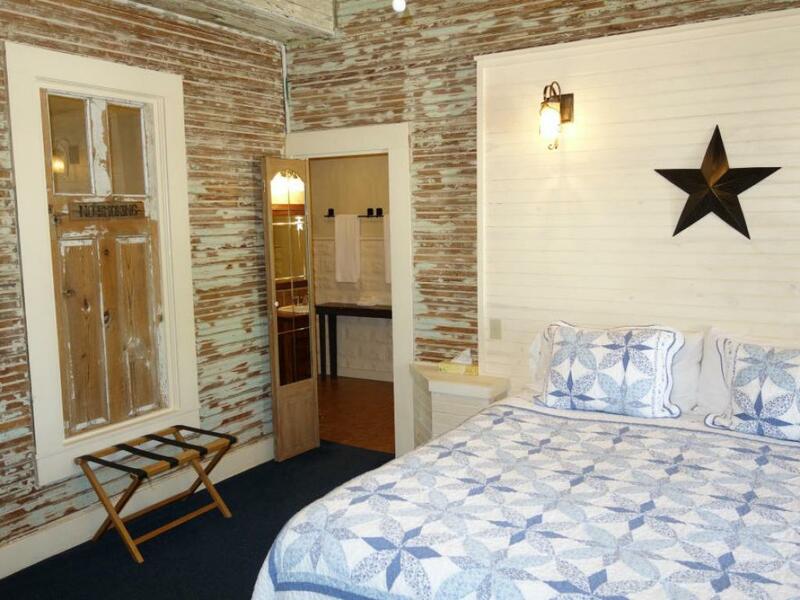 $175.00 Sun-Thurs / $210.00 Fri, Sat, & holidays King size bed, Jacuzzi bathtub with stand-up shower, refrigerator, microwave, private porch and courtyard area, picnic table. 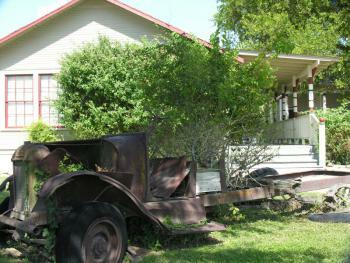 Close to Tavern in the Gruene. 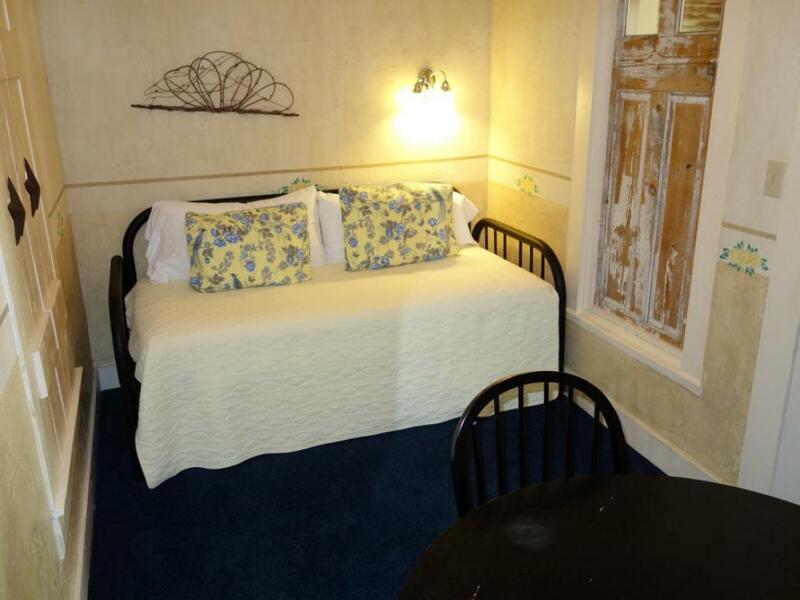 The Belinda Suite is a spacious, and luxurious, guest unit that can accommodate up to 2 adults in two separate rooms. 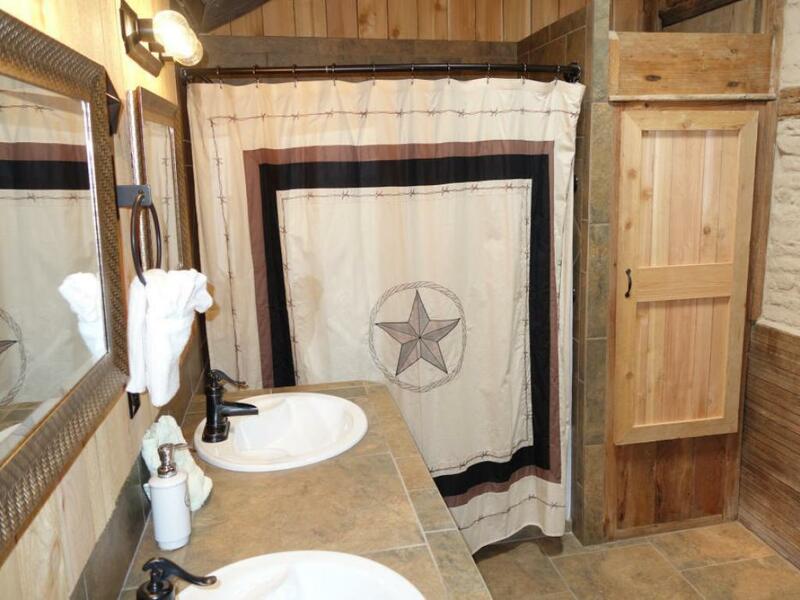 This unit has a hotel-style connecting door that leads to The Lady Banks Suite. 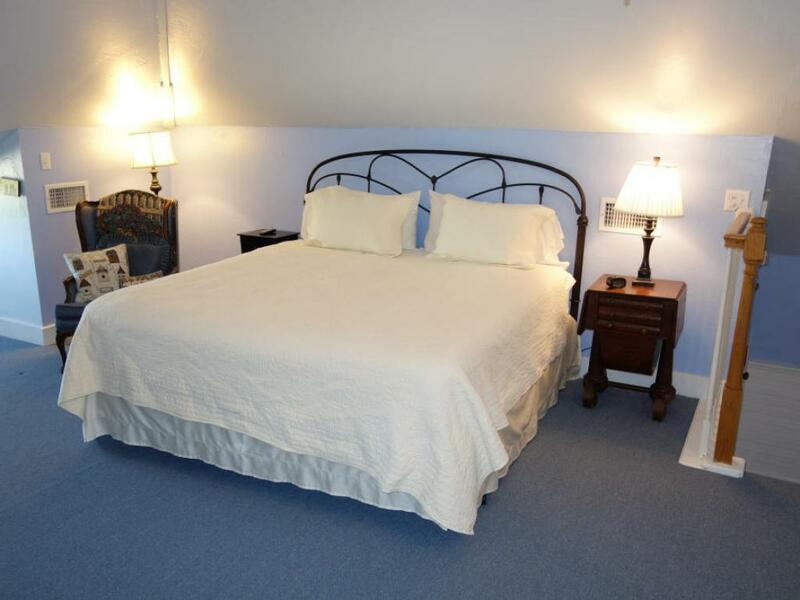 $165.00 Sun-Thurs / $195.00 Fri, Sat, & holidays Queen size bed in bedroom, living room, small stand up shower, sitting room with wet bar and dining/writing table, refrigerator, microwave oven, porch entrance with rocking chairs. 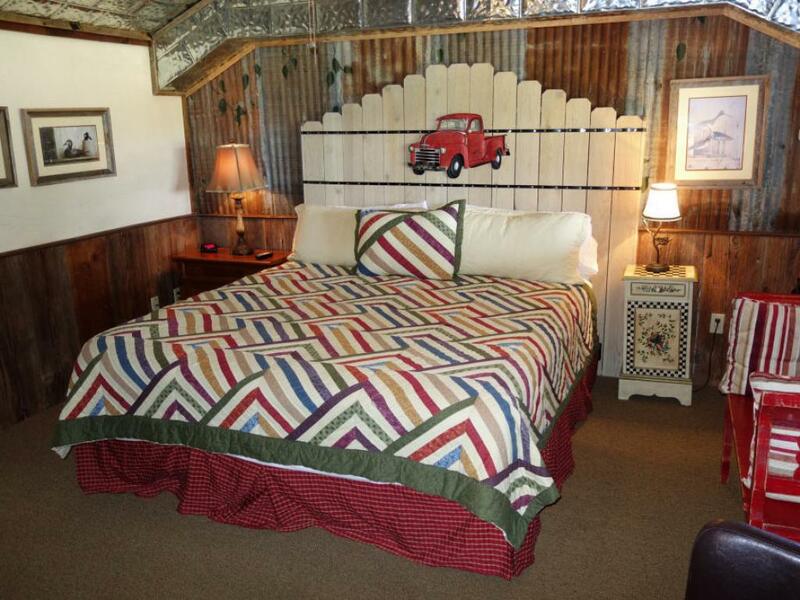 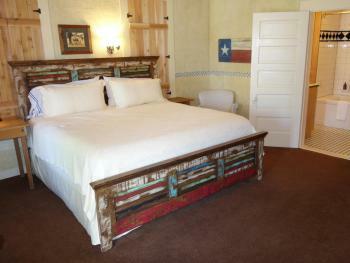 The Gruene Room is a very comfortable guest unit with a high ceiling and beautifully tiled bathroom. 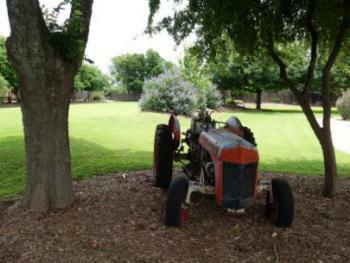 This is the least expensive room at Gruene Homestead Inn and is a great value. 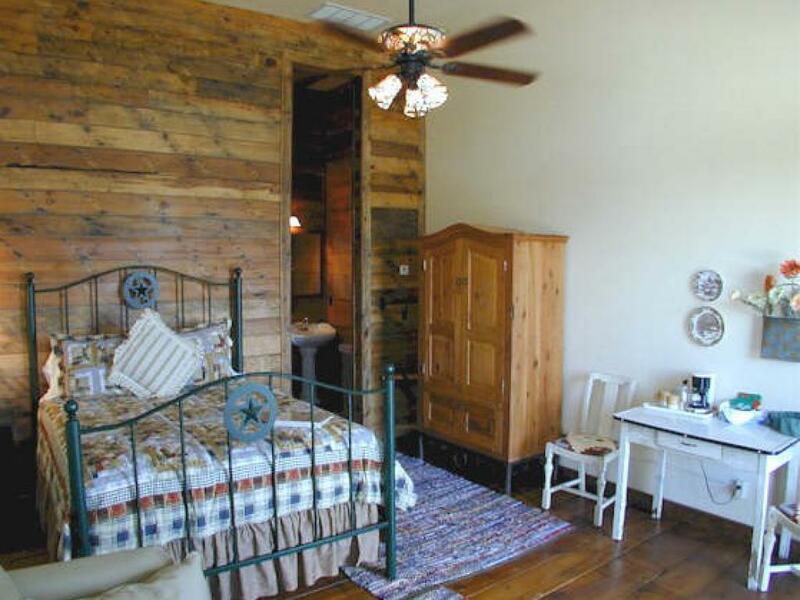 It can accommodate up to 2 people. 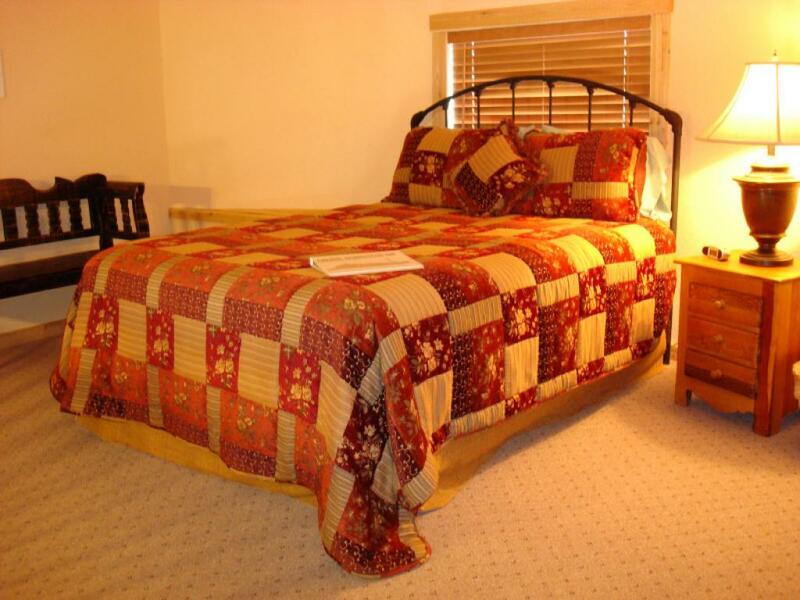 $150.00 Sun-Thurs / $180.00 Fri, Sat, & holidays King bed, stand-up shower, sitting area. 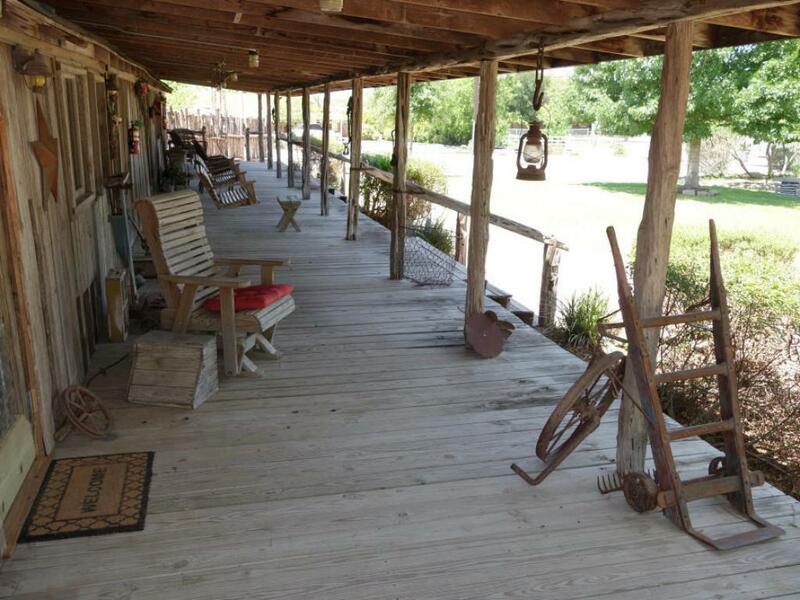 Watch the deer stroll by from your private porch. 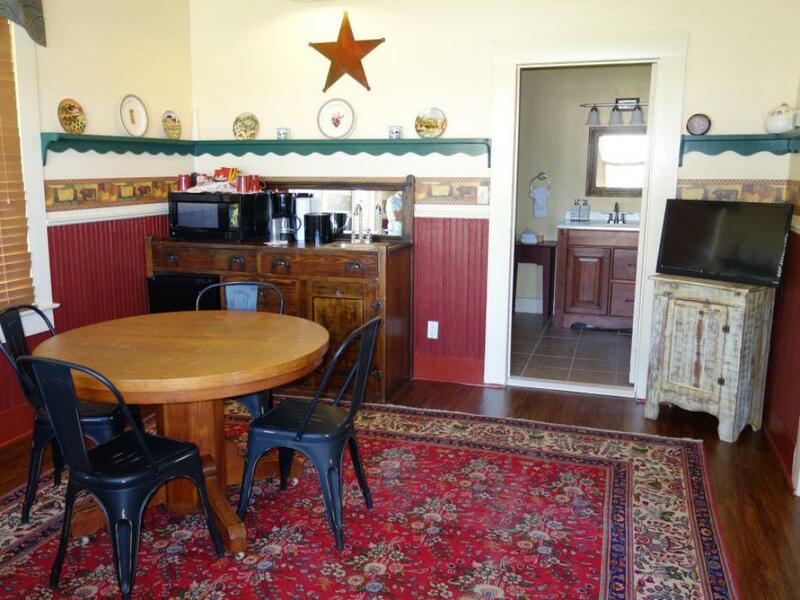 Recently upgraded, The Back Porch is a medium sized guest unit and the only one in The Country House that enters from the backside. 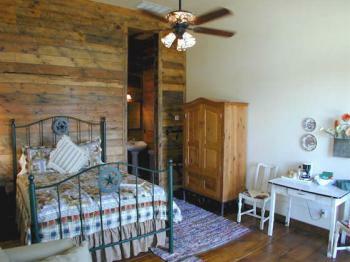 It can accommodate up to 2 adults and 1 child. 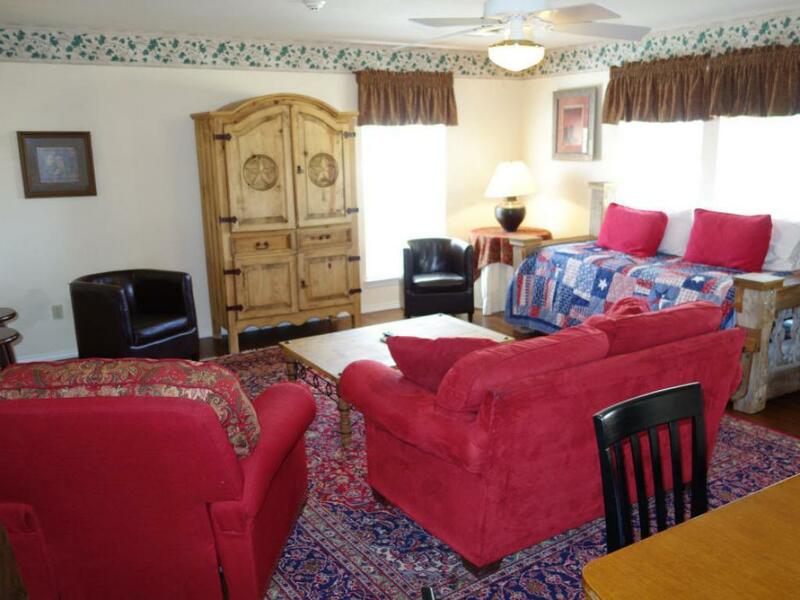 $165.00 Sun-Thurs / $195.00 Fri, Sat, & holidays King bed, single-size fold-out chair, large stand-up shower with seat, sitting area, private porch, wheelchair ramp, hand-rails in bathroom. 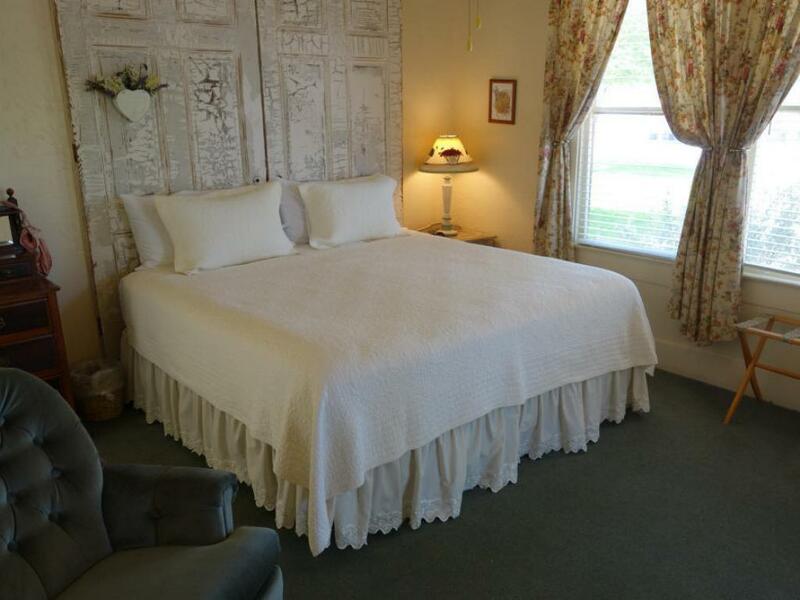 A great alternative to a hotel, this country inn is a collection of historic farm houses located on eight acres of an original German homestead. Innkeepers Ed and Billie Miles have maintained the estate's historical integrity by relocating and restoring old homes from the area. 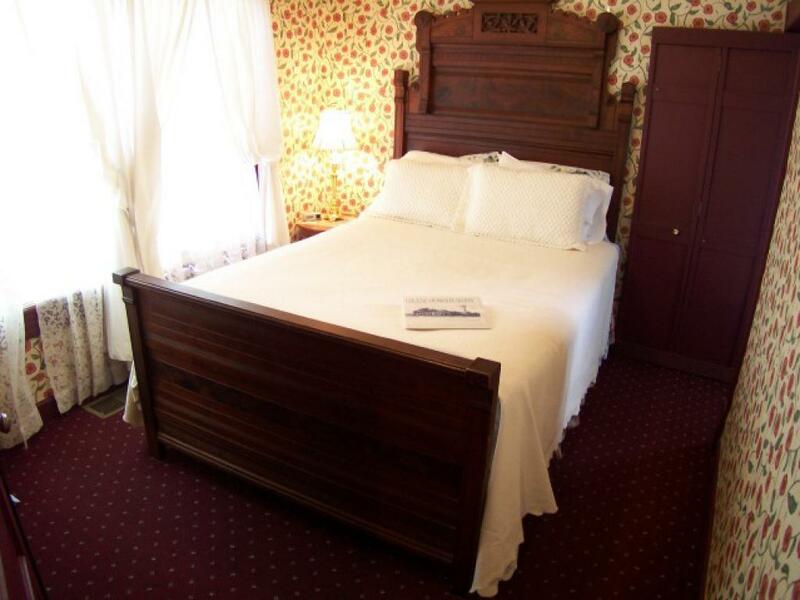 Guests experience the essence of a bygone era while lodging in one of the 22 individually designed and decorated rooms and suites that have been outfitted with modern conveniences. 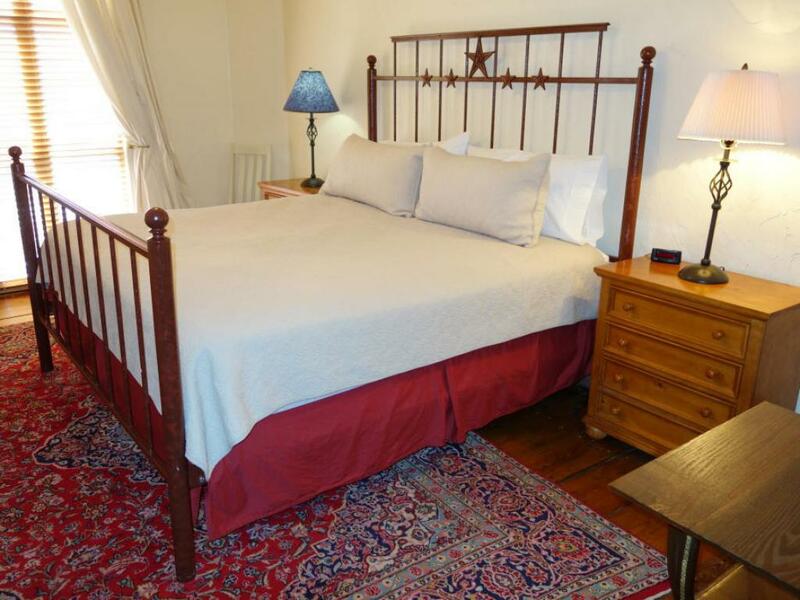 The Inn is within minutes of historic Gruene and New Braunfels, the Guadalupe and Comal rivers, Schlitterbahn Waterpark, Natural Bridge Caverns, McKenna Children's Museum, San Marcos Outlet Malls, and Landa Park and The Bandit golf courses. 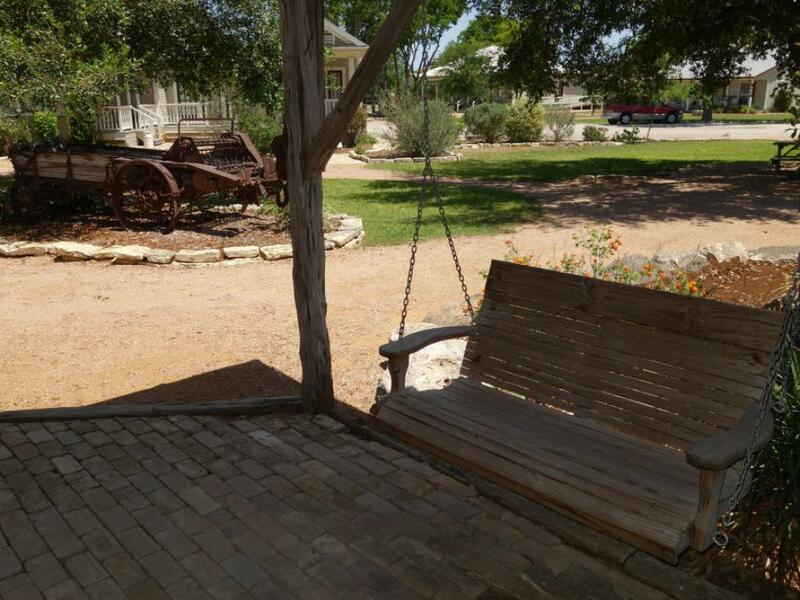 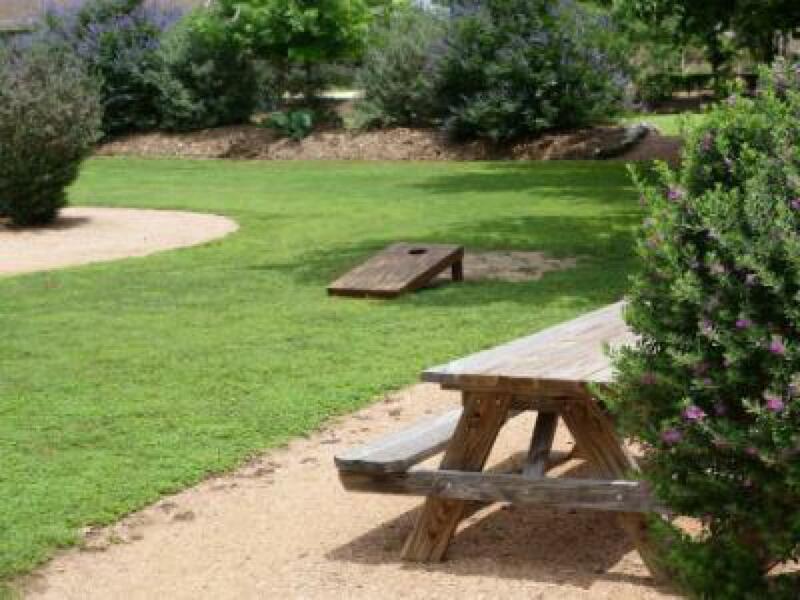 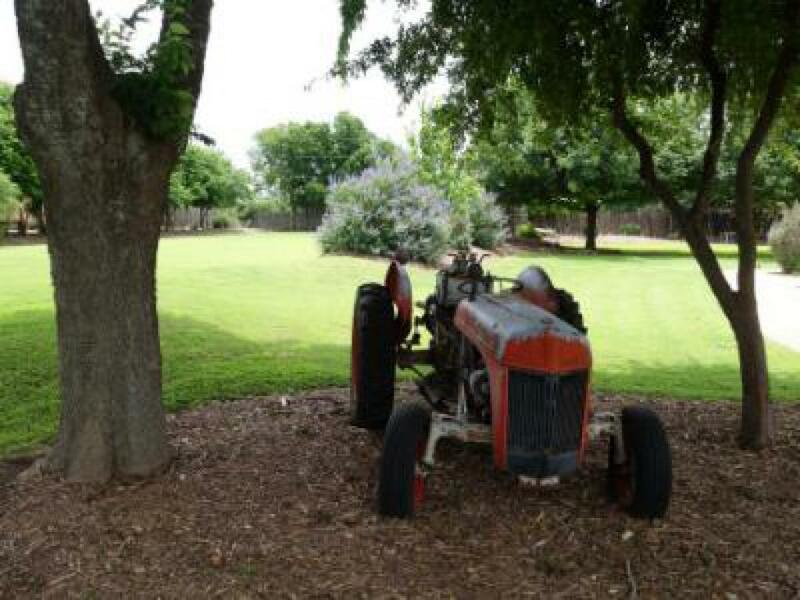 The location is convenient for visitors interested in golfing, rafting, tubing, fishing, dancing, shopping, touring the Texas hill country, or just relaxing in a rocking chair on one of the spacious porches. Amenities include a full, Texas-style hot breakfast, private bathrooms with a choice of Jacuzzi tubs, antique soaking tubs, or stand up showers, King or Queen size beds, cable television, coffee makers, individual A/C controls, private porches, and free wireless and broadband internet access. 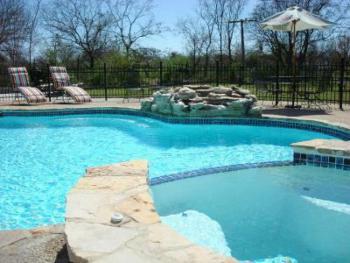 Guests are invited to enjoy the swimming pool, hot tub, and beautiful grounds landscaped with native plants. 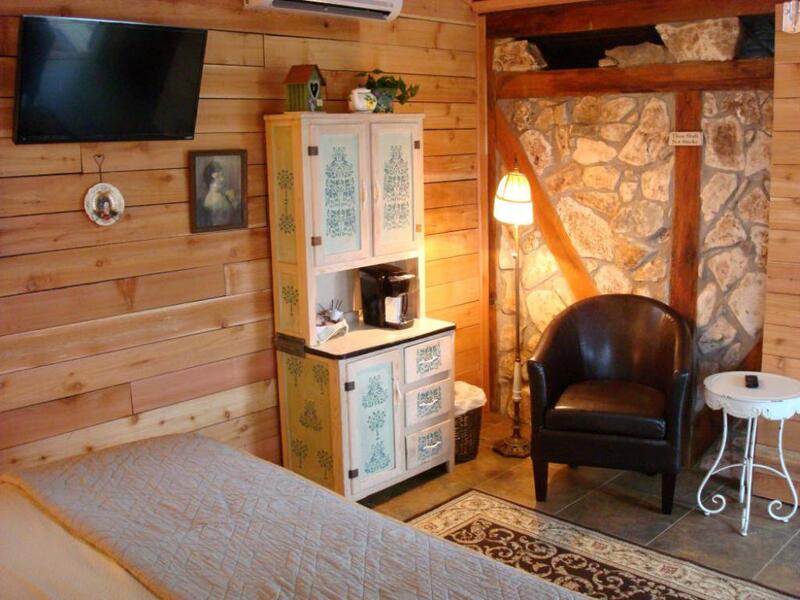 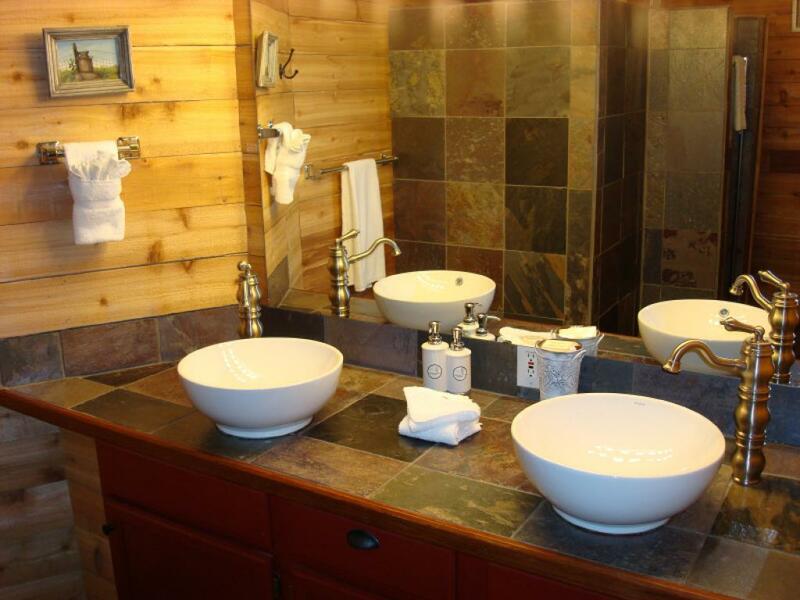 The inn can provide family accommodations in cottages, cabins, and guest houses that sleep up to 5 people per unit with a maximum occupancy of 61 people on the property. 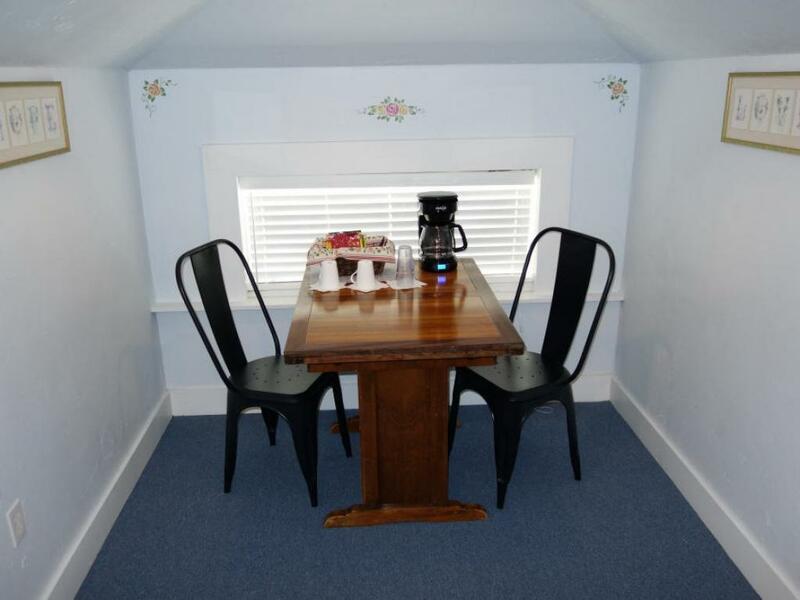 Daytime rental of on site meeting space for up to 75 people is available as well. 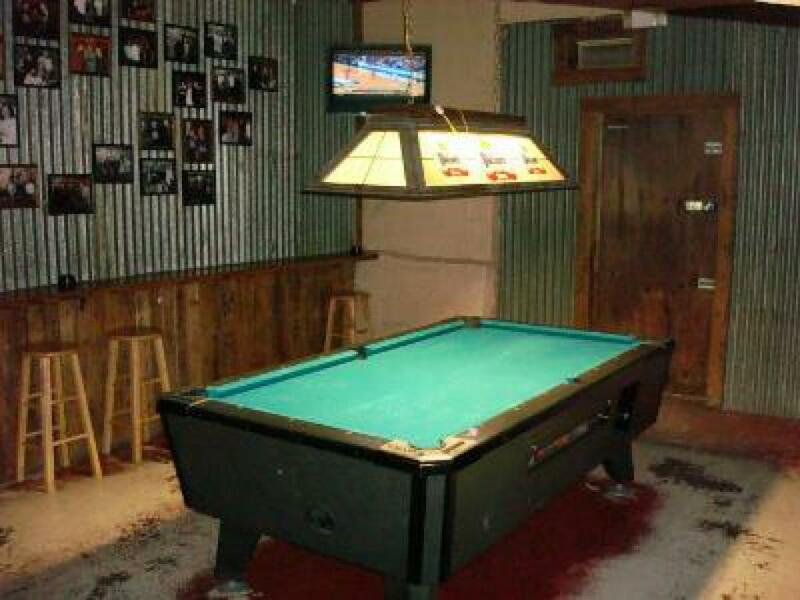 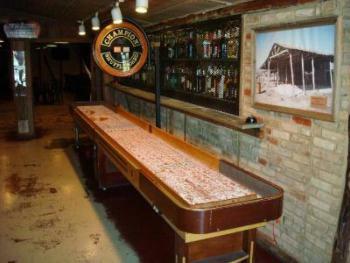 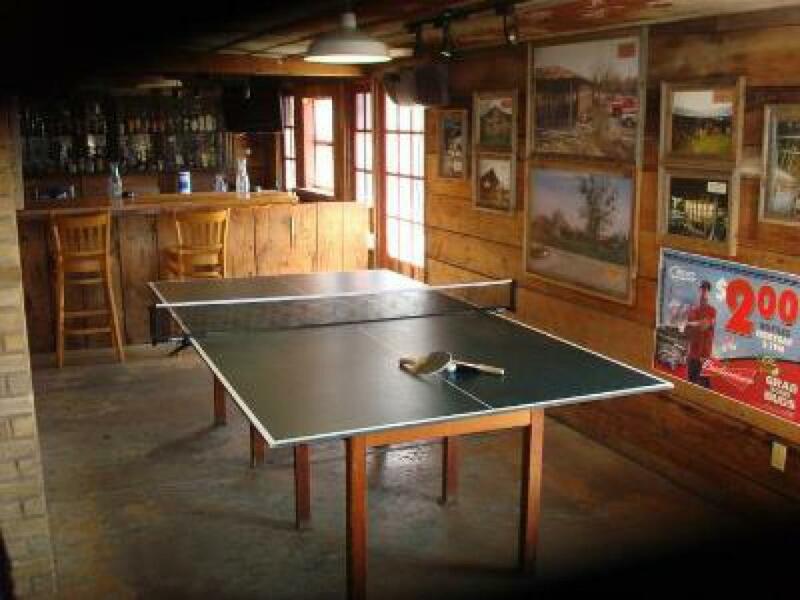 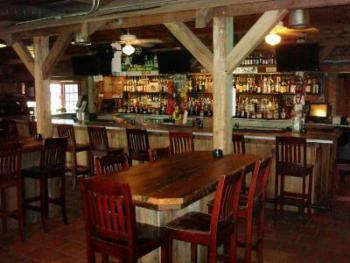 Tavern in the Gruene, housed in a renovated pole barn on the same eight acre site as the Inn, is an air conditioned live music venue with a full bar, pool table, shuffleboard table, garden patio, and horseshoe pit. 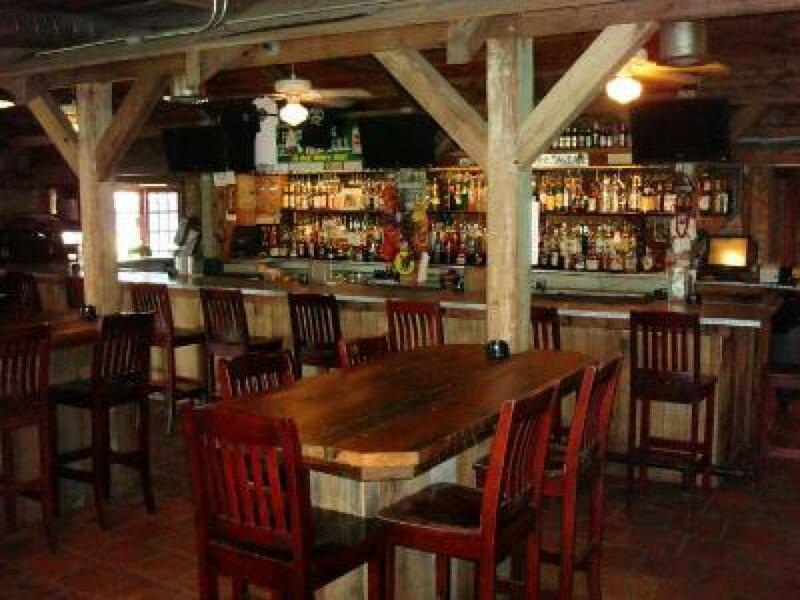 The Tavern features local and regional original music acts in the Americana, Country, Rockabilly, Blues, and Texas Music genres... a cool spot for good times!